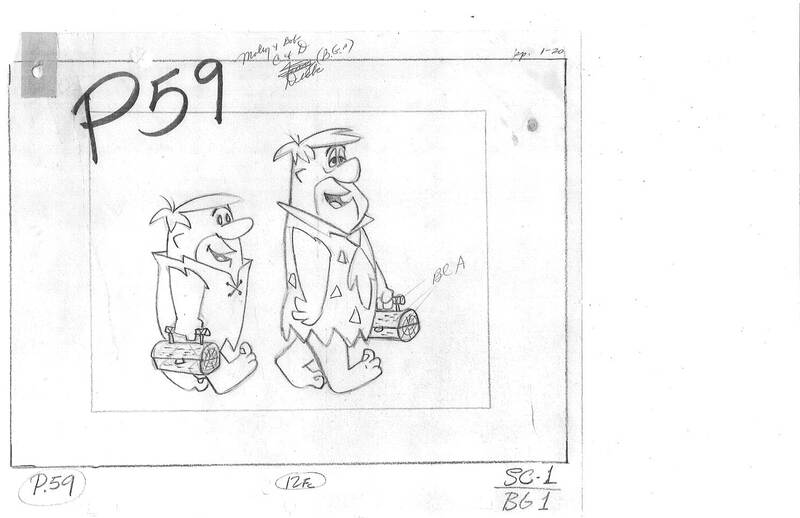 Years ago when I was working at Hanna Barbera working on my What-A-Cartoon shorts, I paid a visit to the archives there. 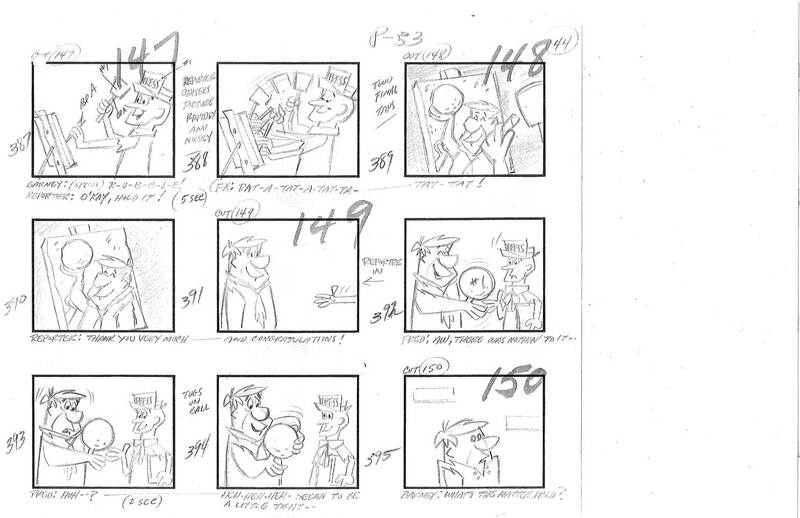 It was filled with all the artwork from every show Bill and Joe had done over the years. 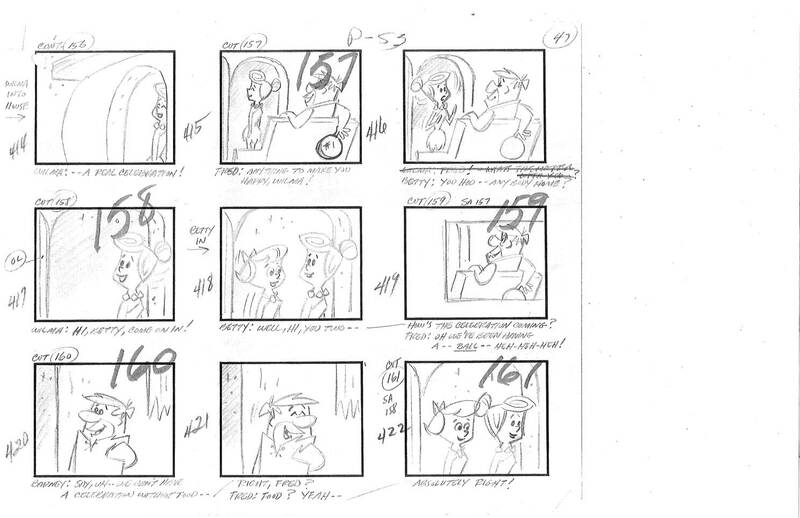 It was truly an animated wonderland. Original pencil drawings on paper. 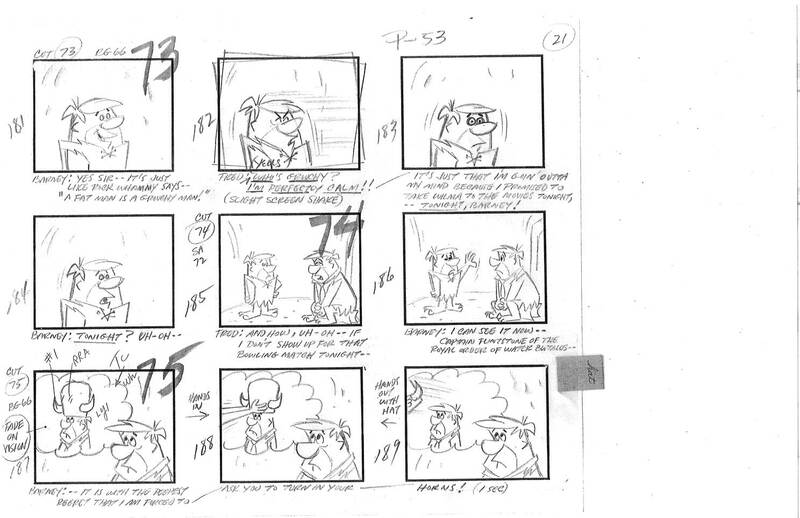 I was in awe! 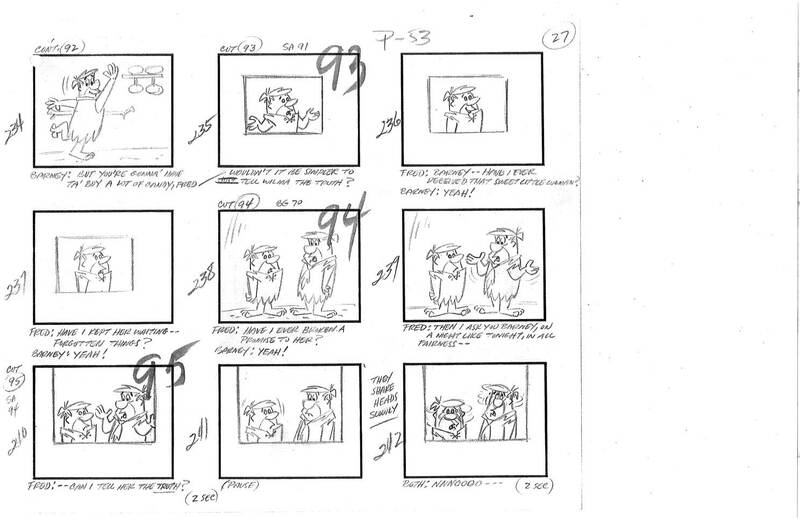 In those days, you were actually allowed to check the artwork out like books at a library, something you can not do at the Disney or Warner Bros archives. 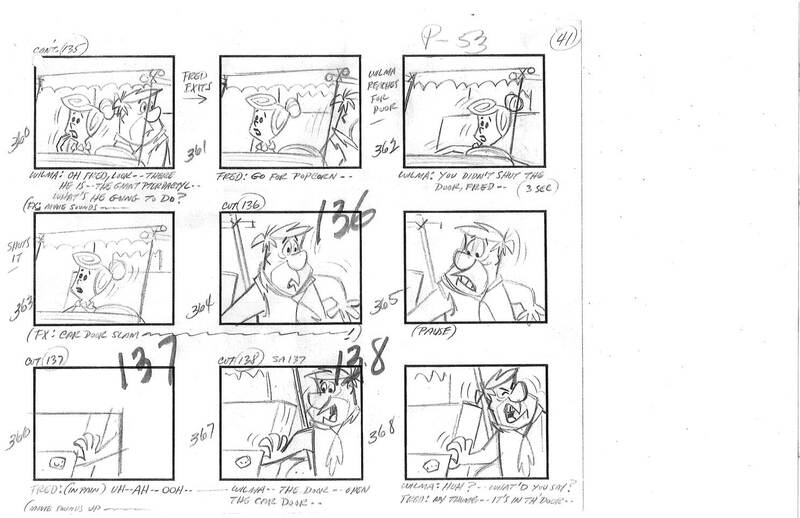 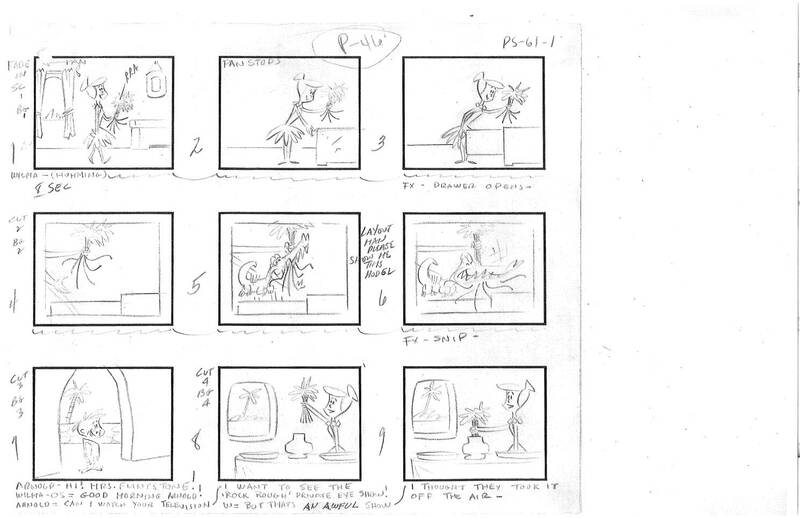 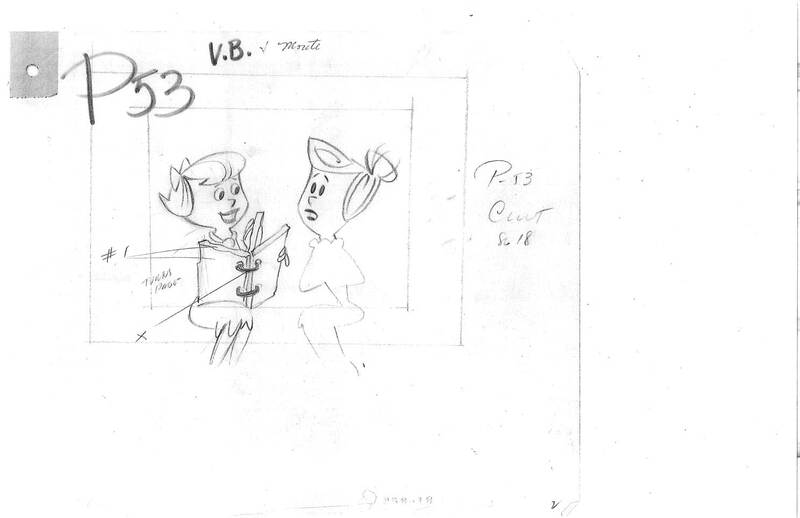 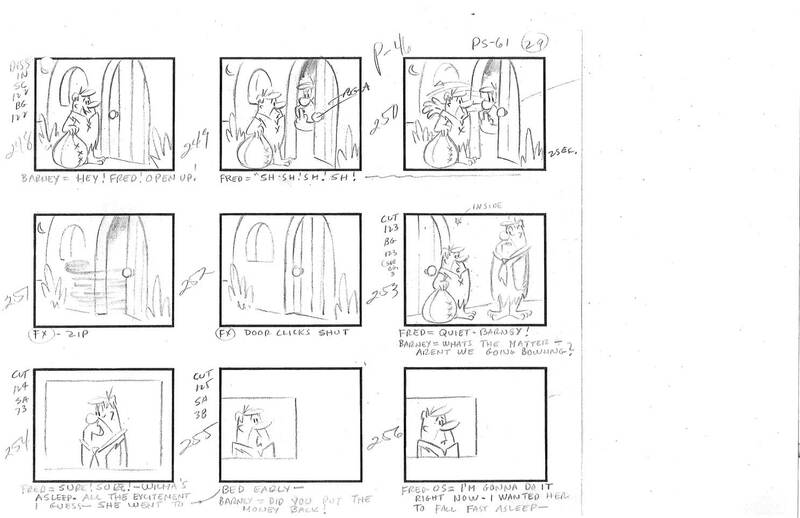 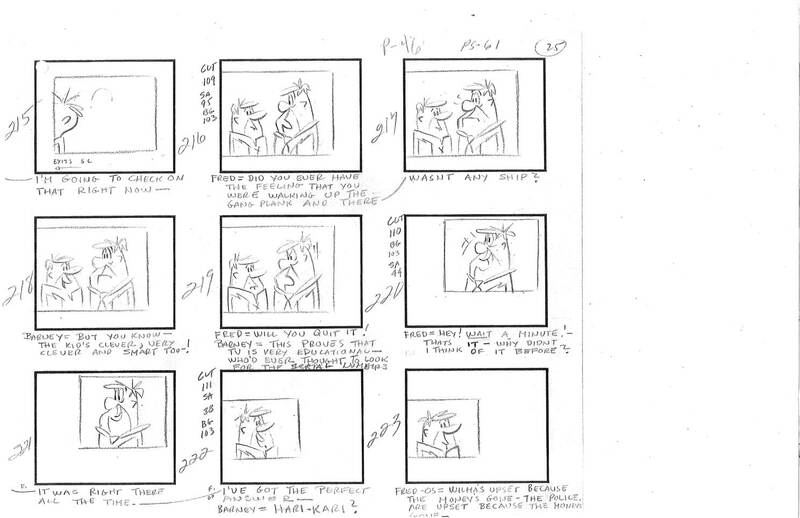 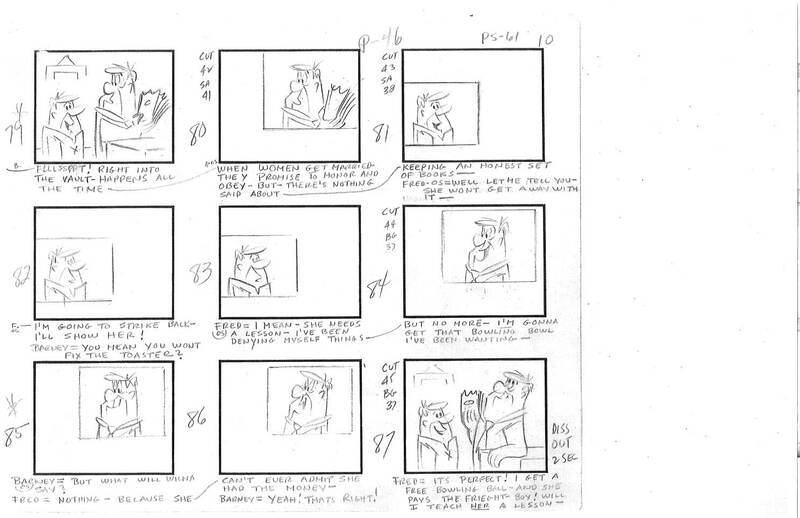 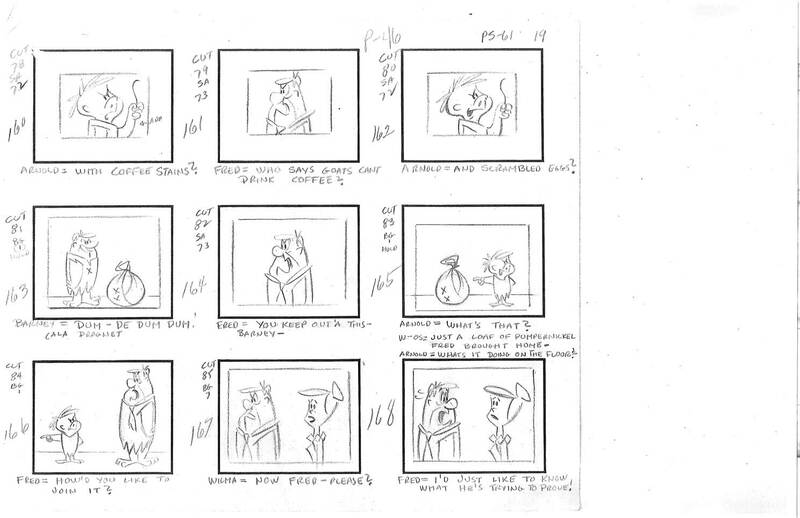 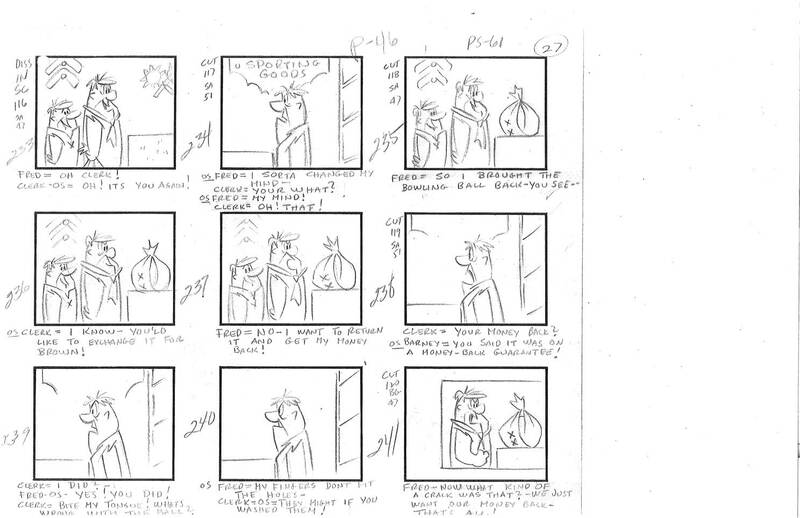 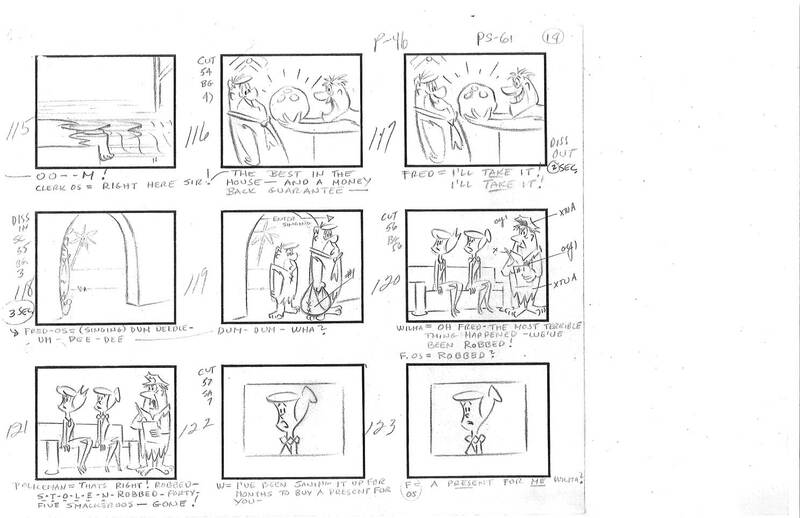 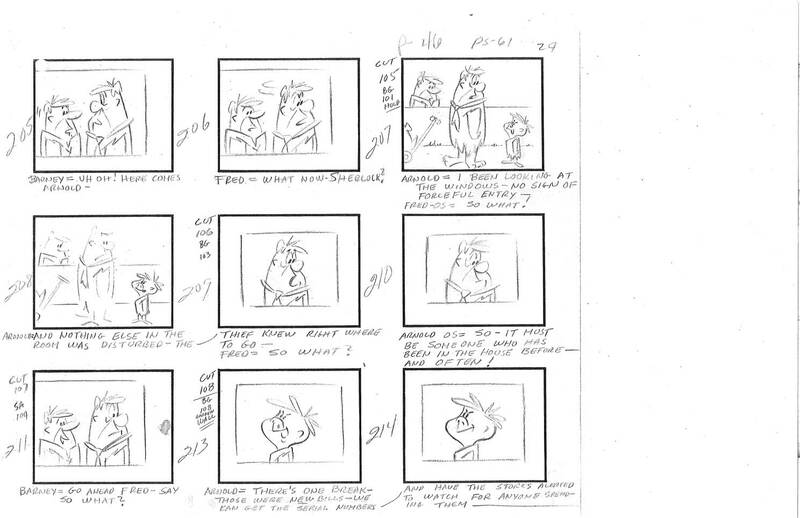 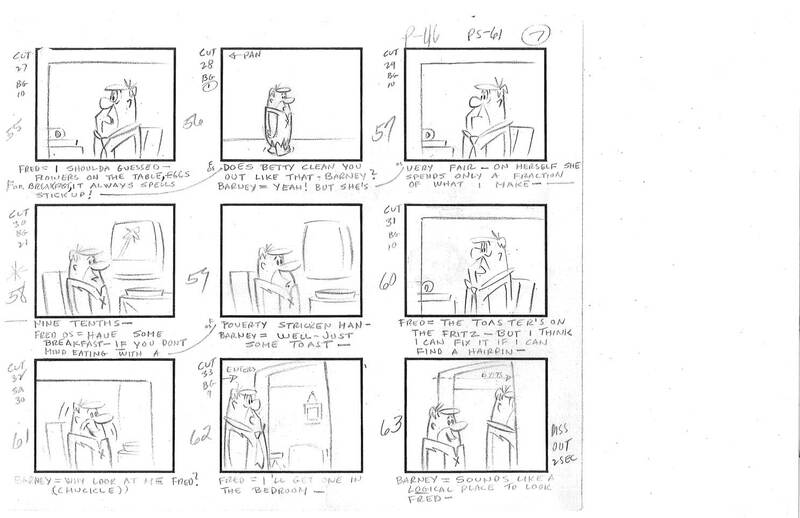 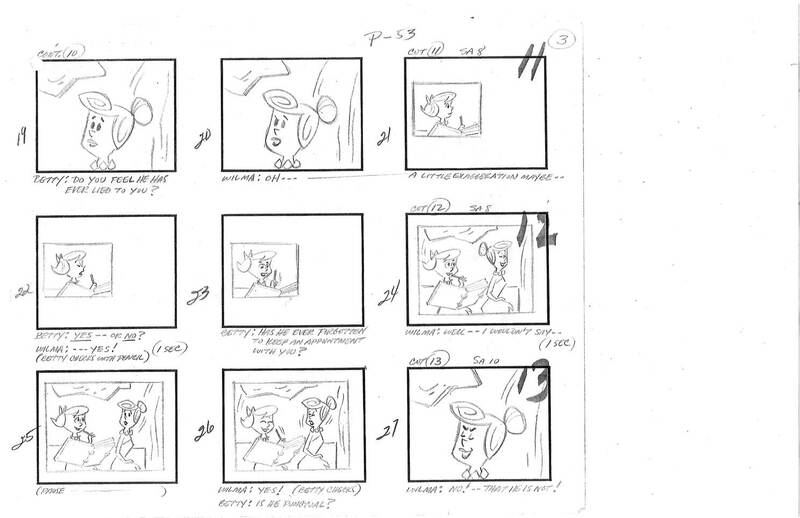 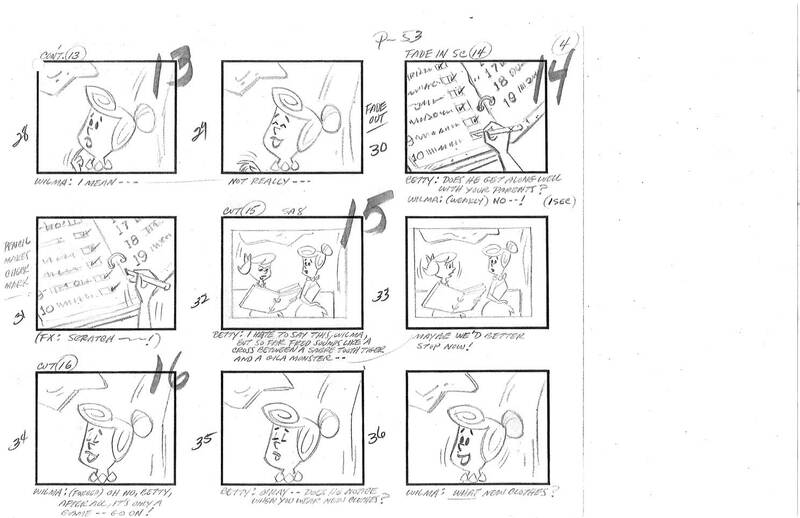 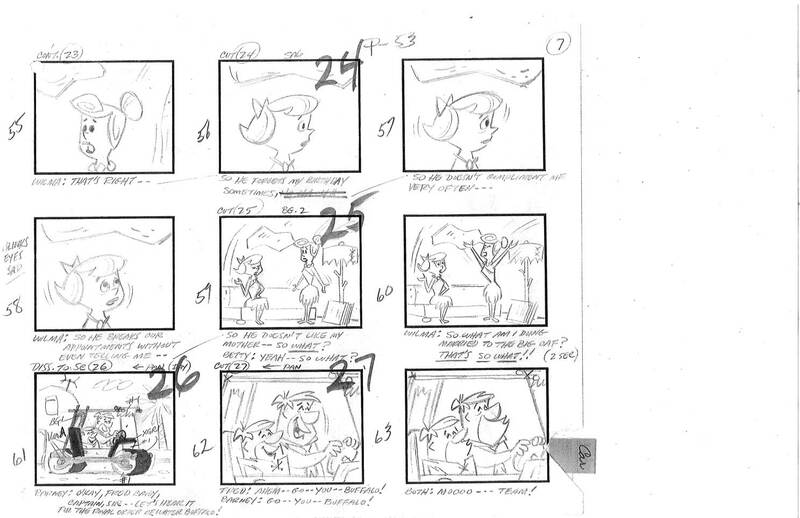 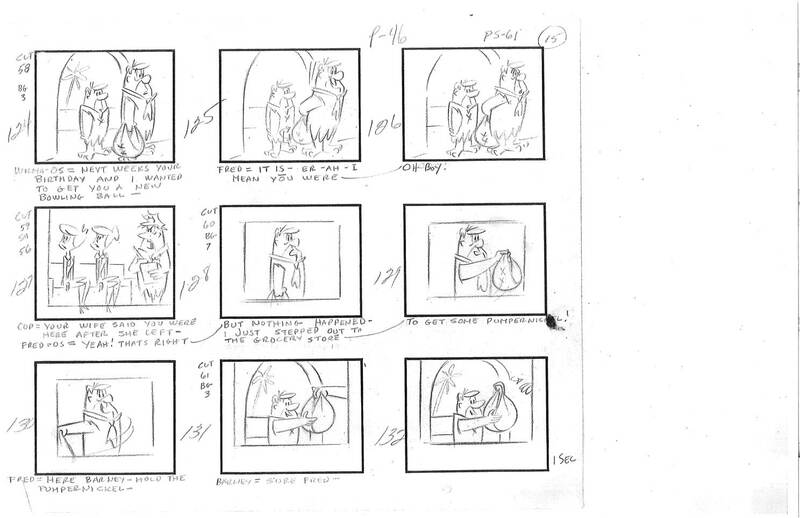 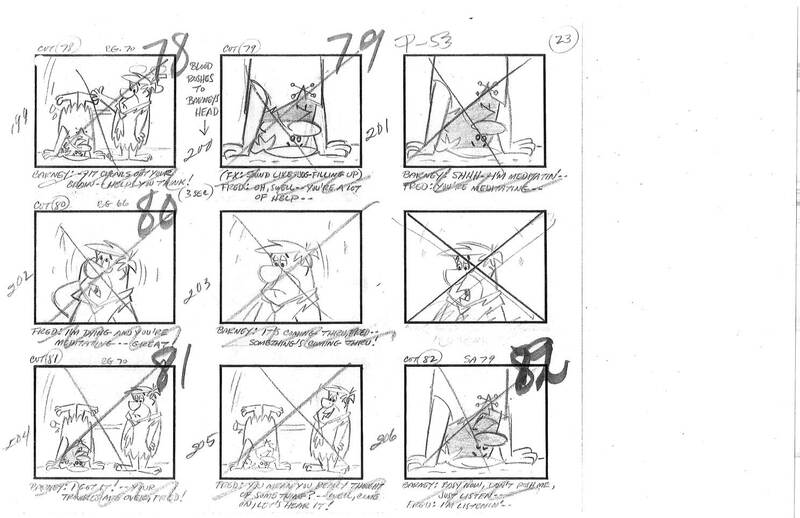 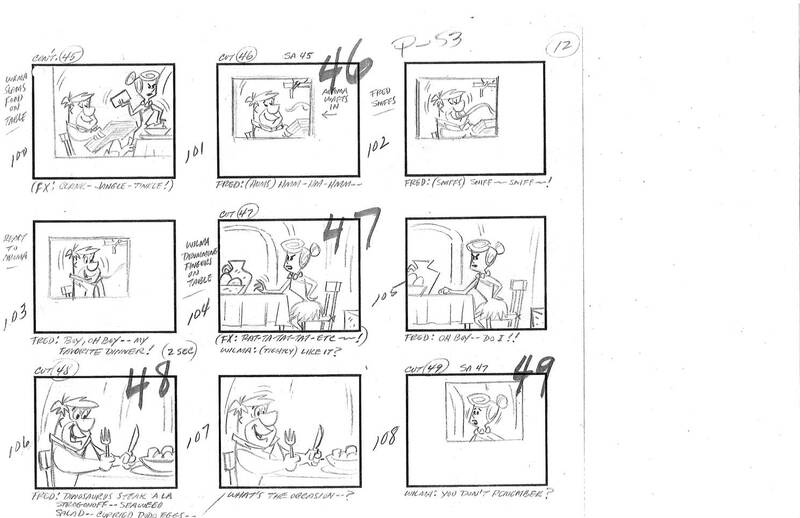 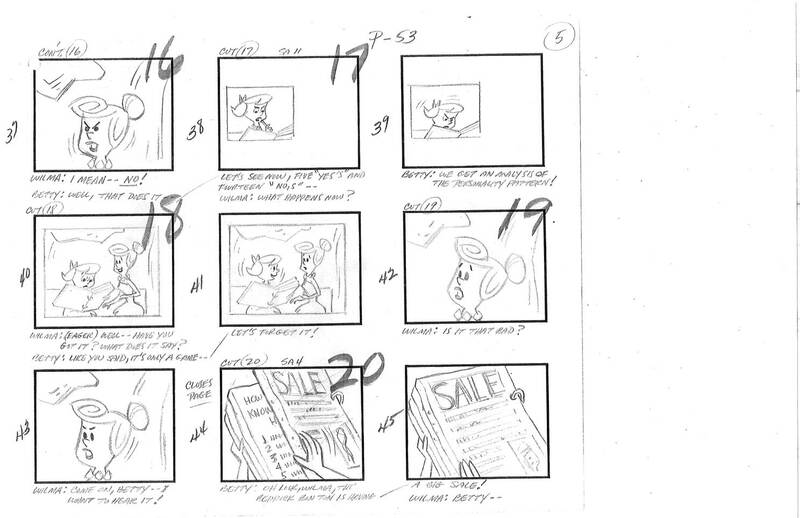 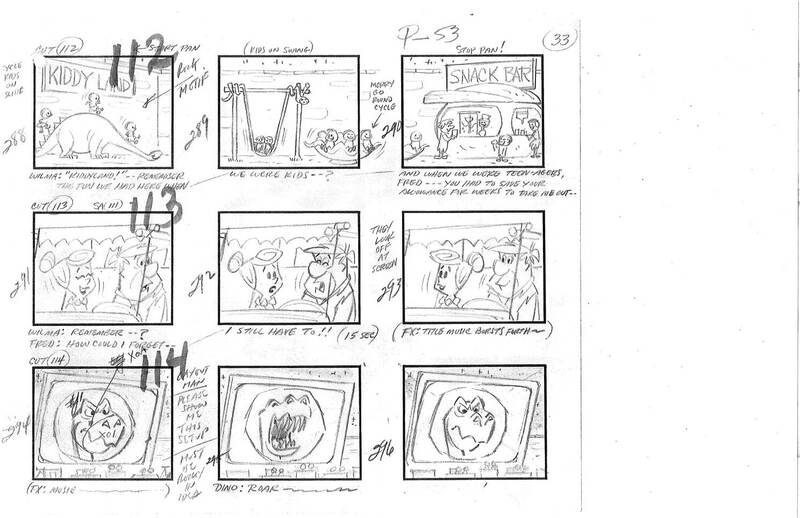 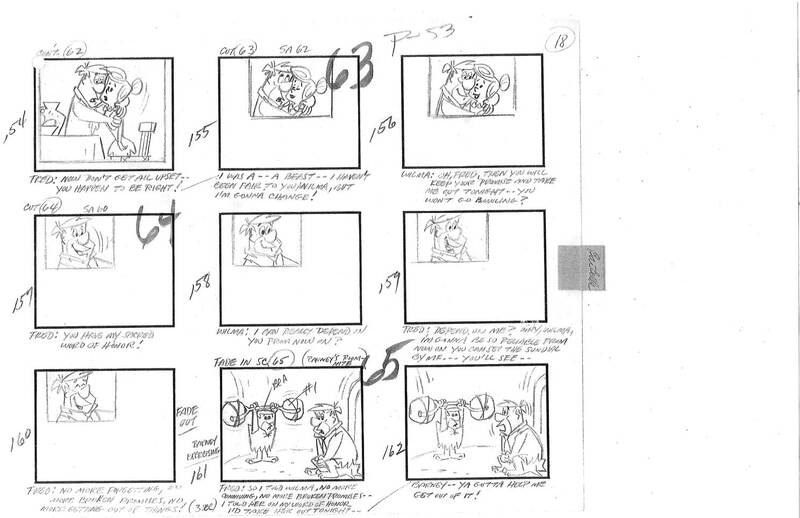 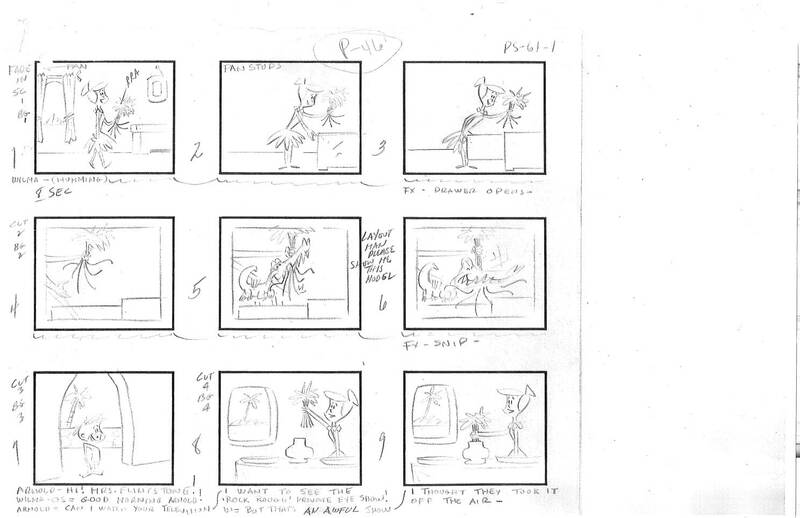 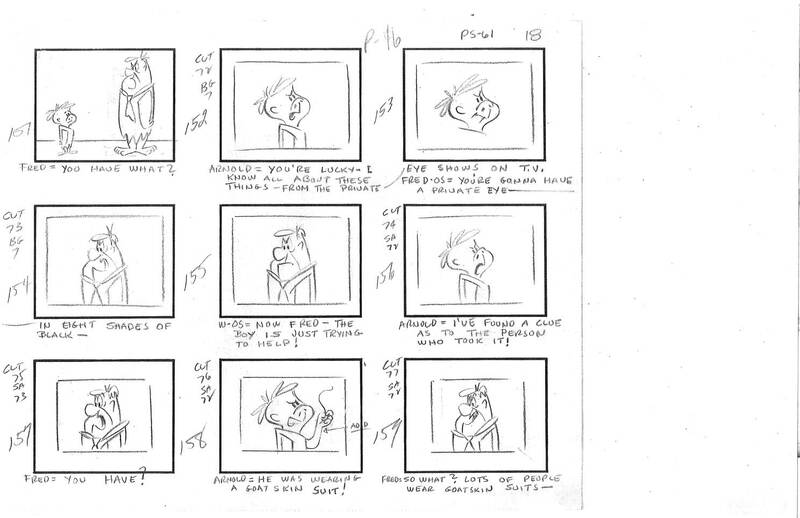 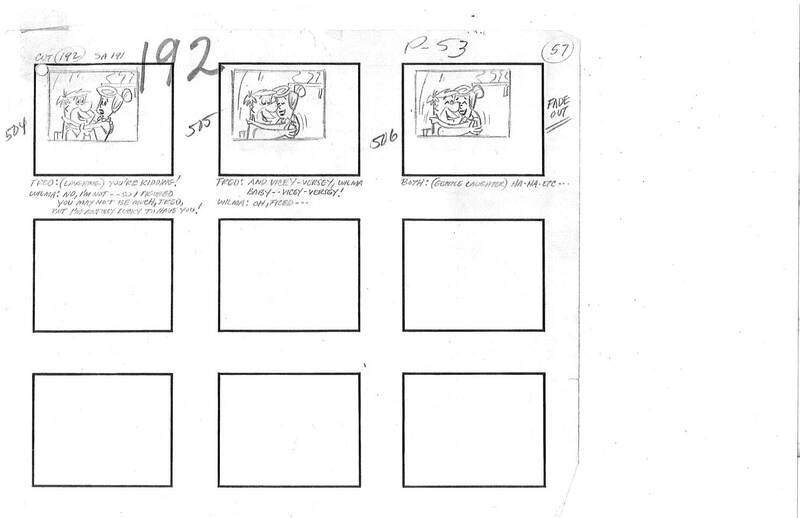 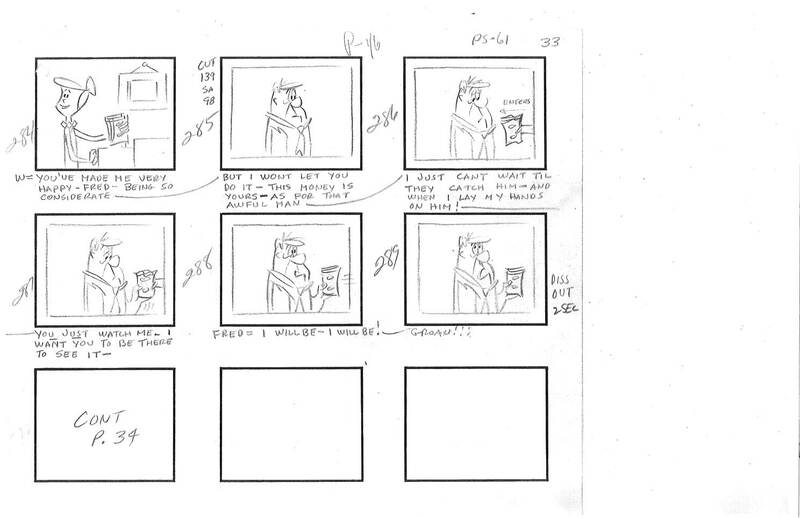 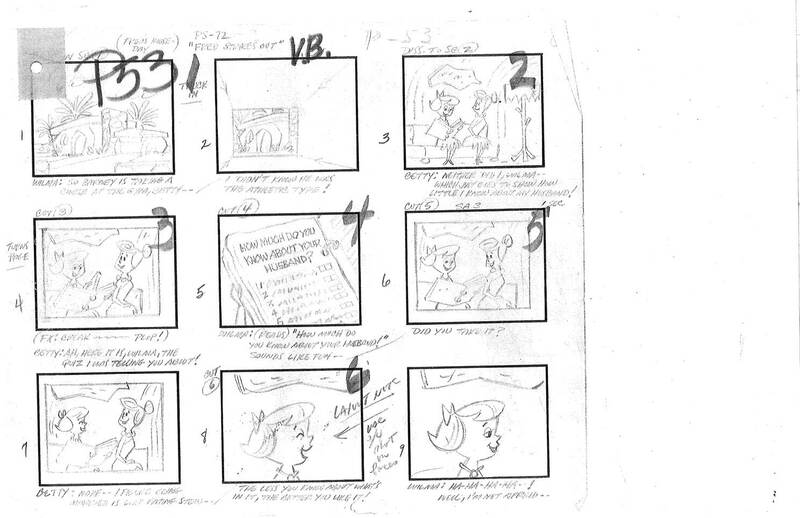 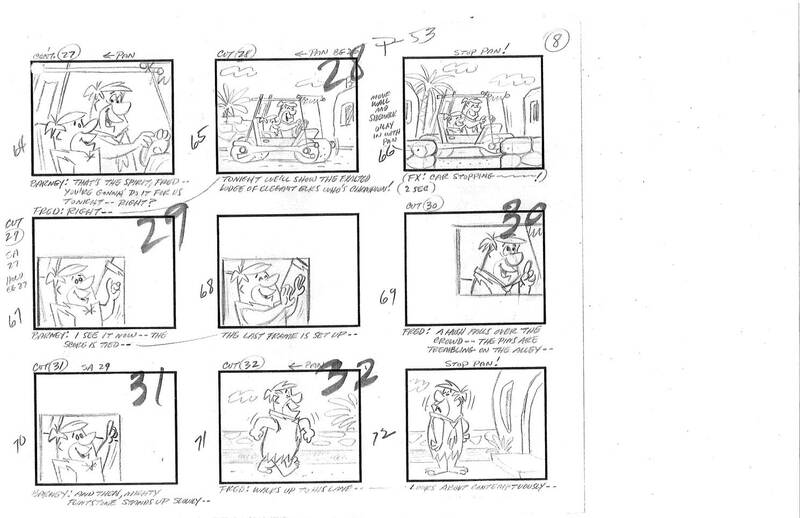 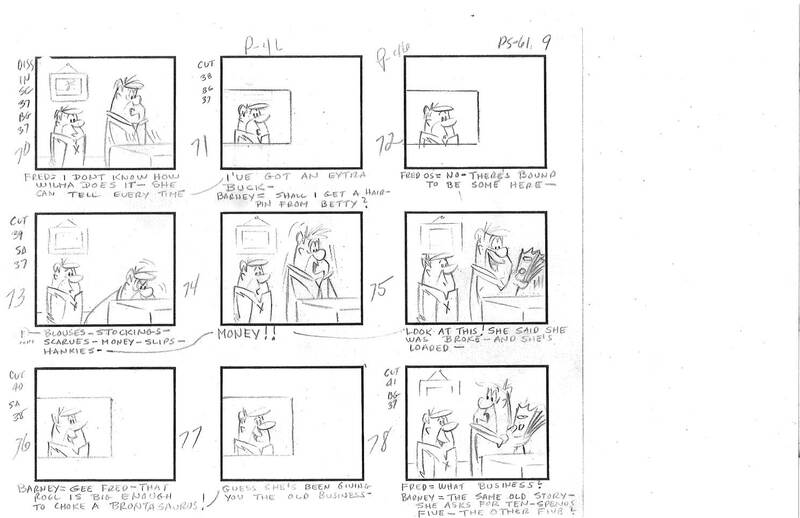 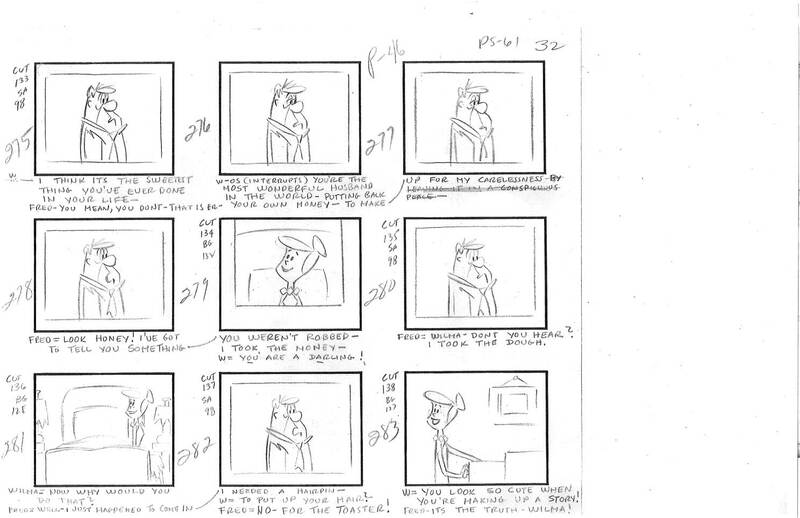 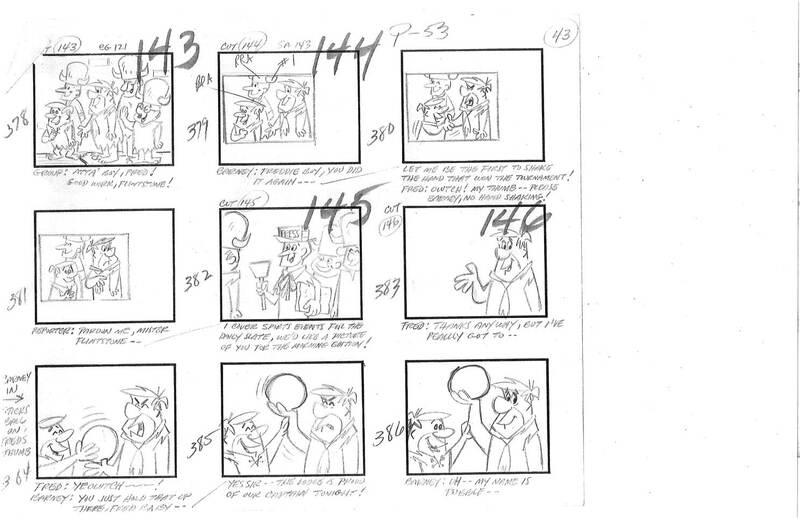 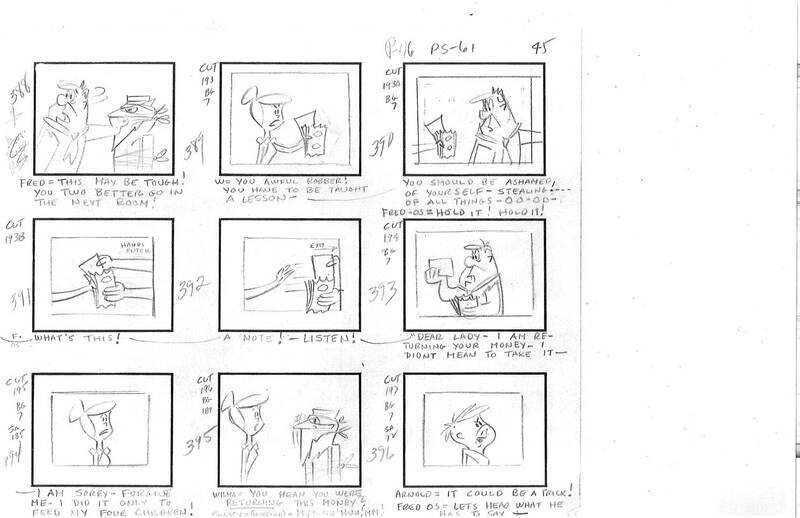 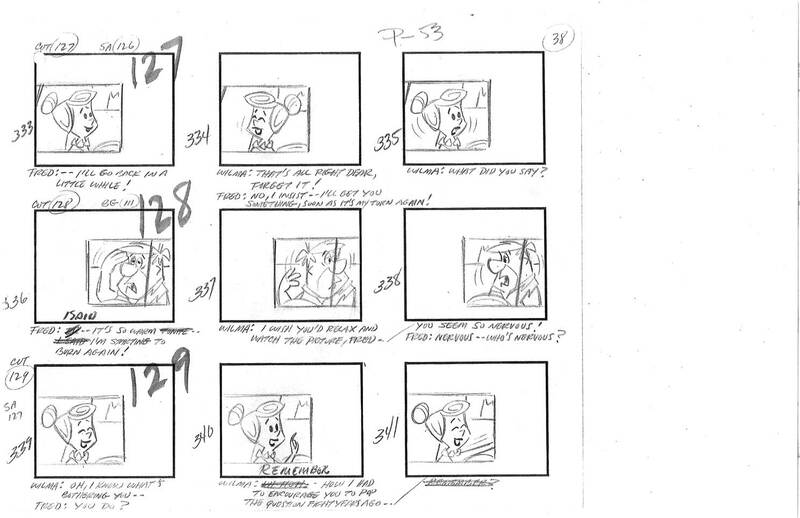 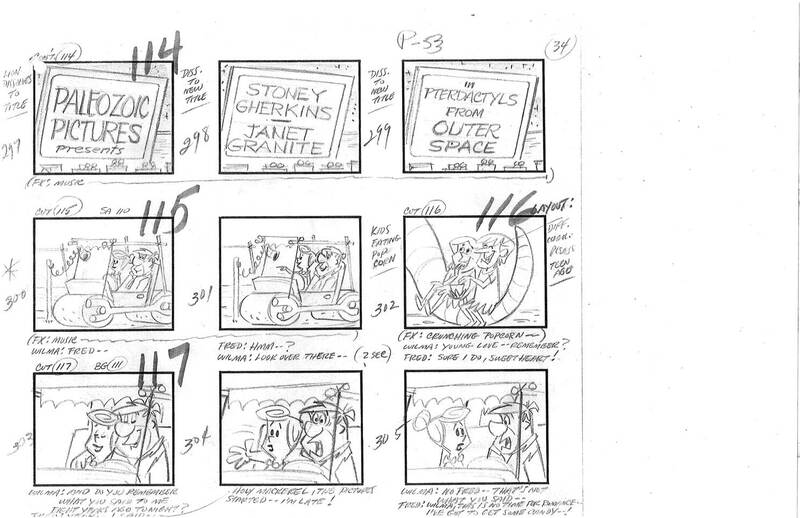 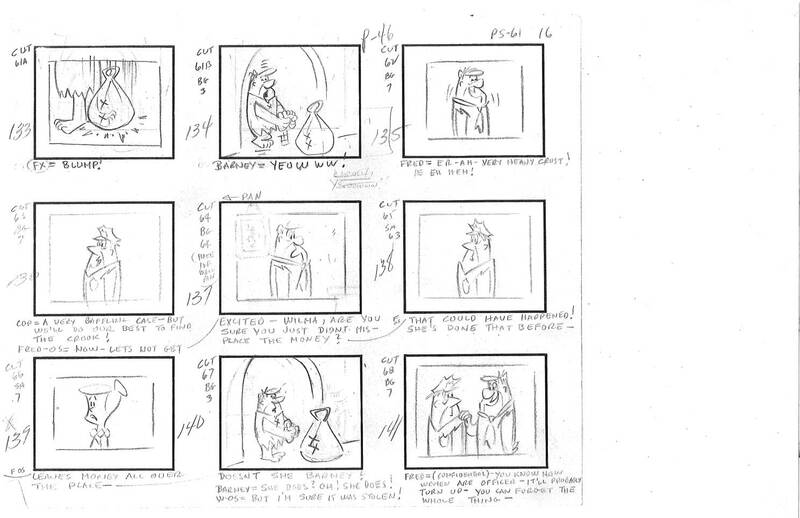 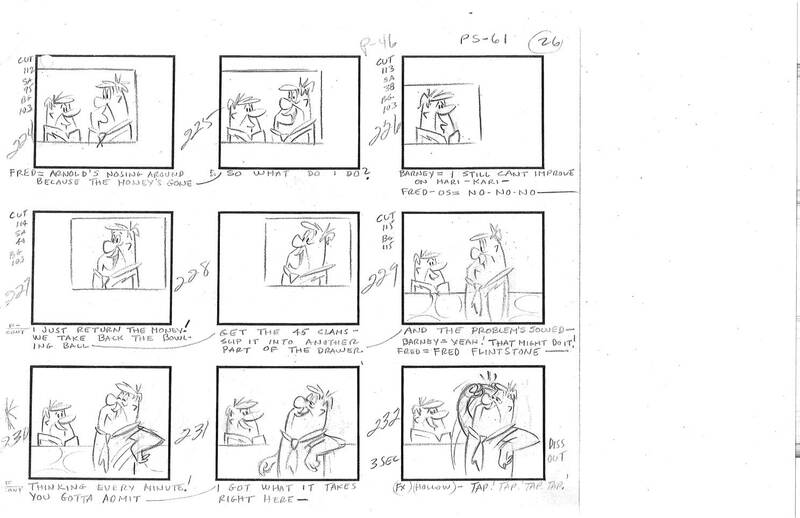 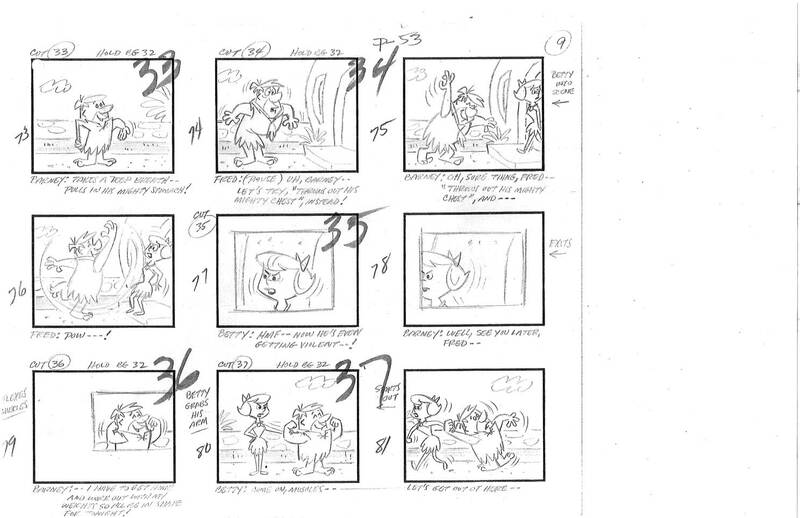 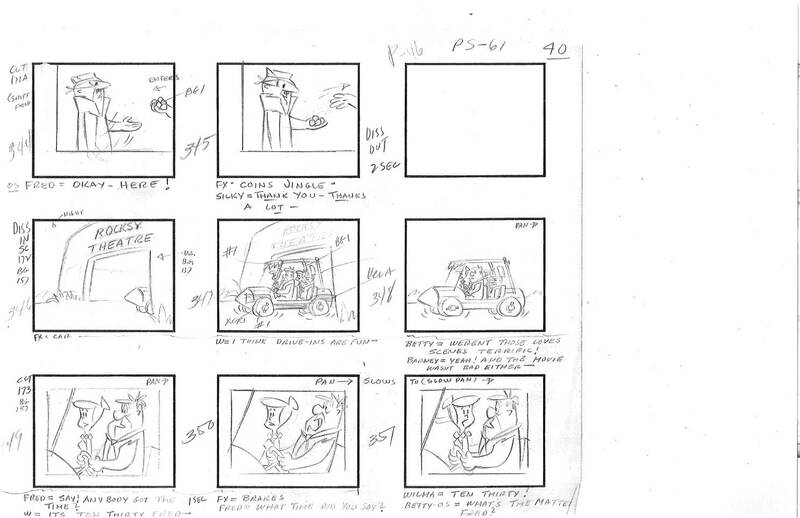 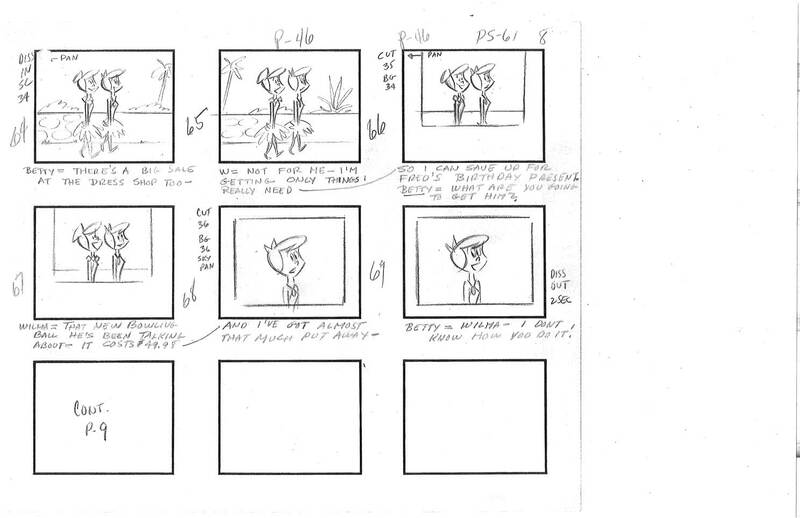 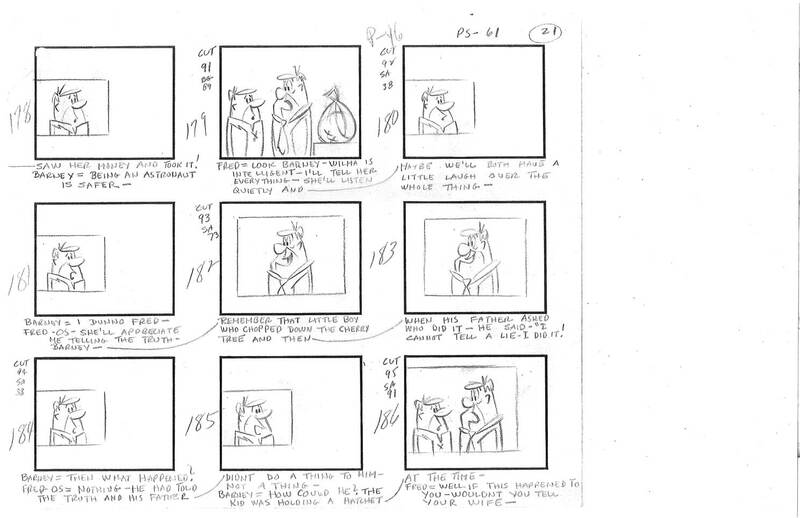 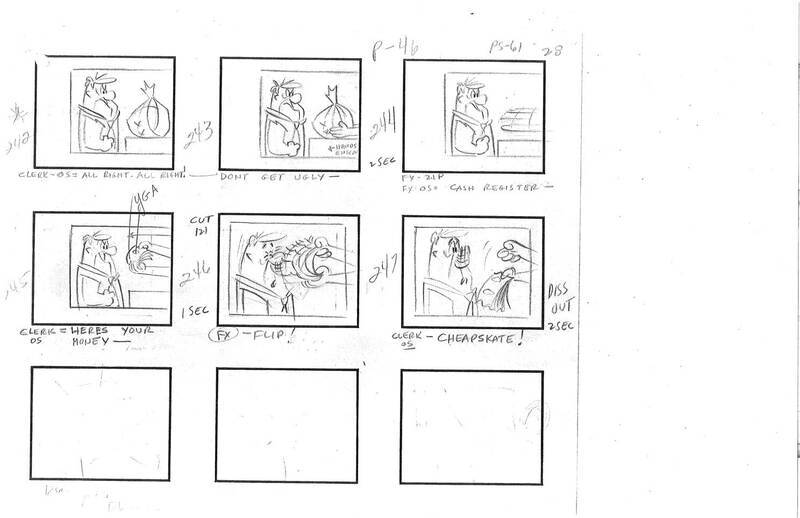 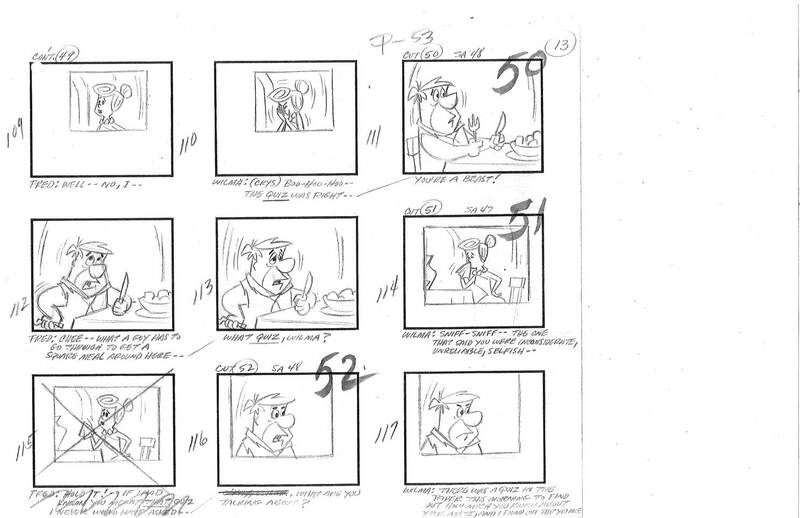 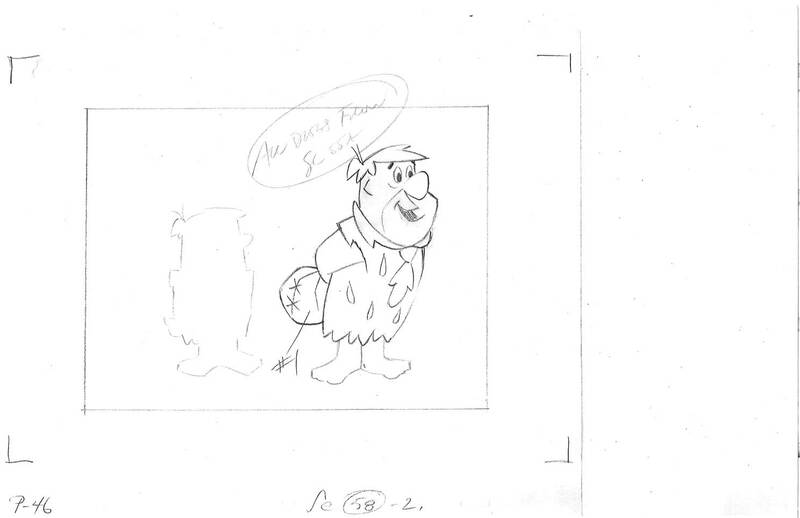 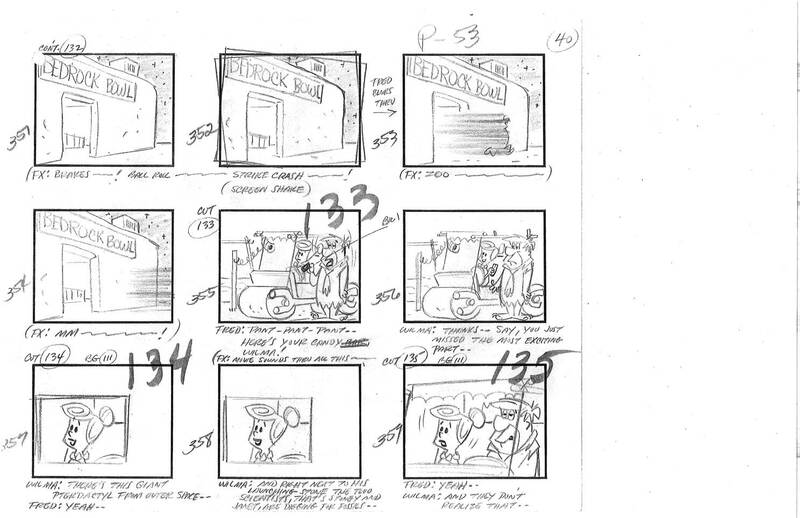 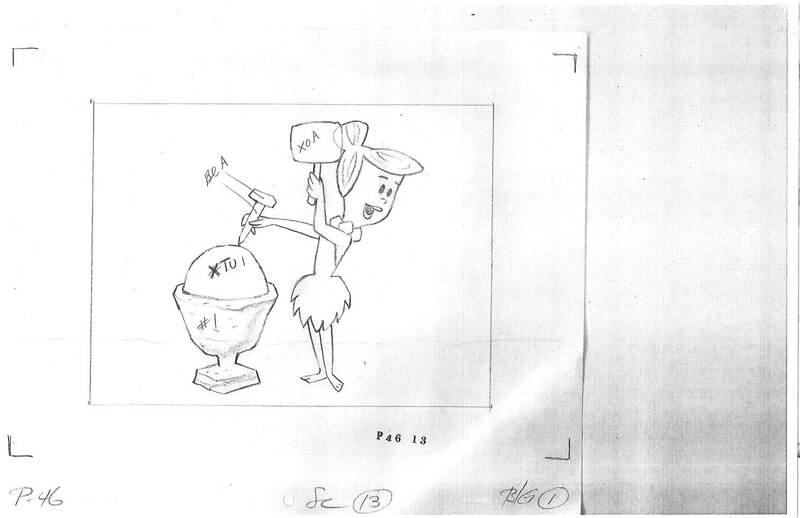 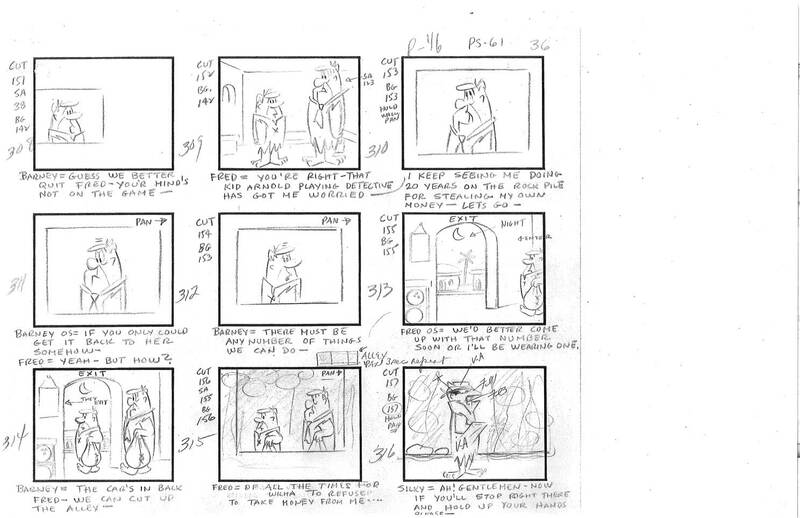 I borrowed a Flintstones storyboard because they were always my favorite and pored over it amazed at how well it was drawn and the simplicity of the shots. 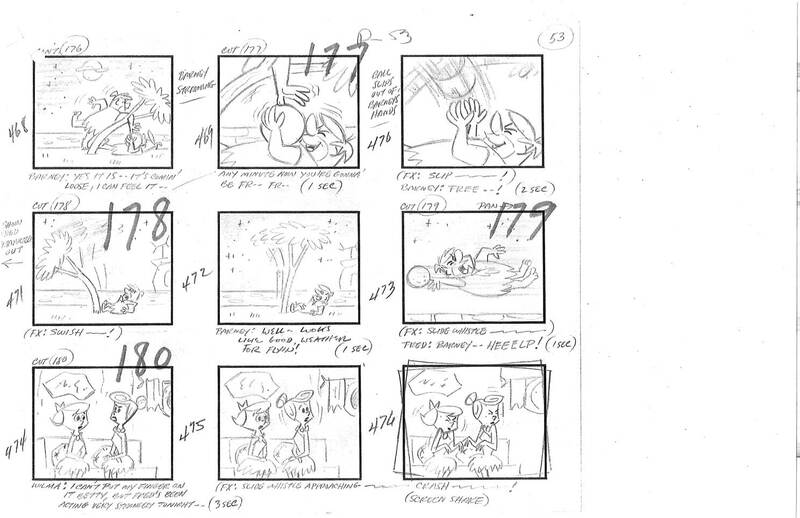 There was even some cut out scenes that I guess were deleted for time. 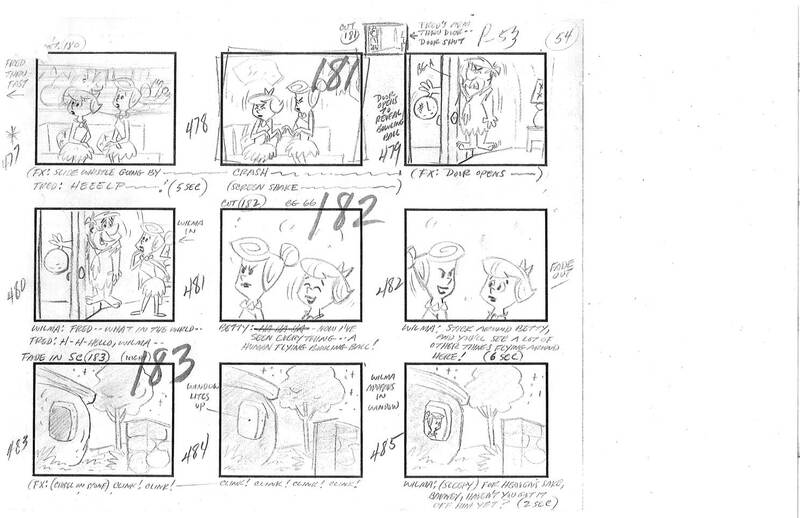 To my amazement there was some layouts stuff in-between the board as well and it was like truly meeting celebrities because those were the real drawings, the breath and sweat and lifeblood poured into them. 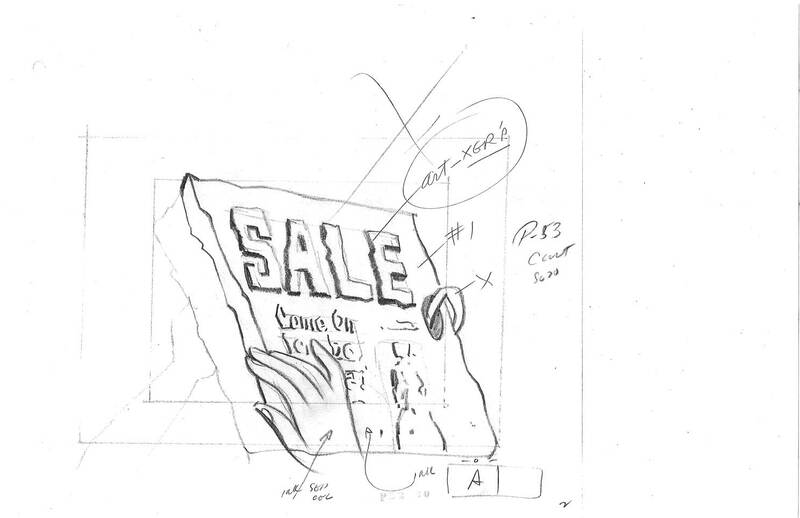 I managed to xerox a copy of them but never borrowed another one. 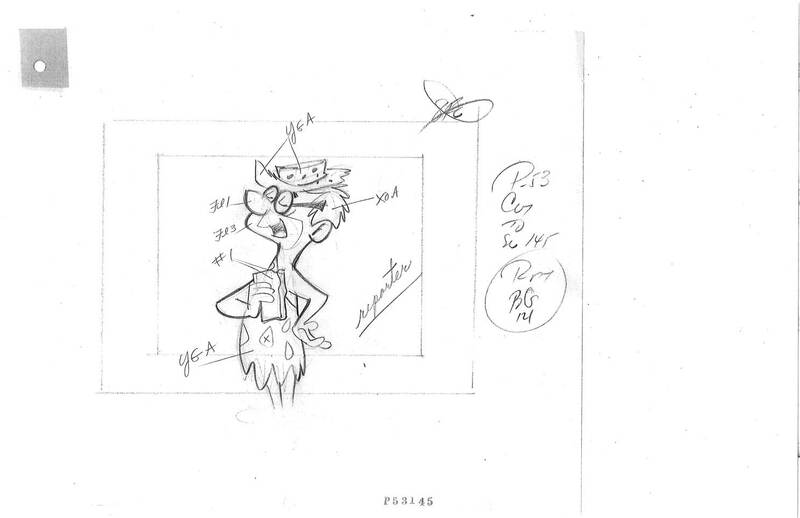 I really should have because it’s a true piece of history. 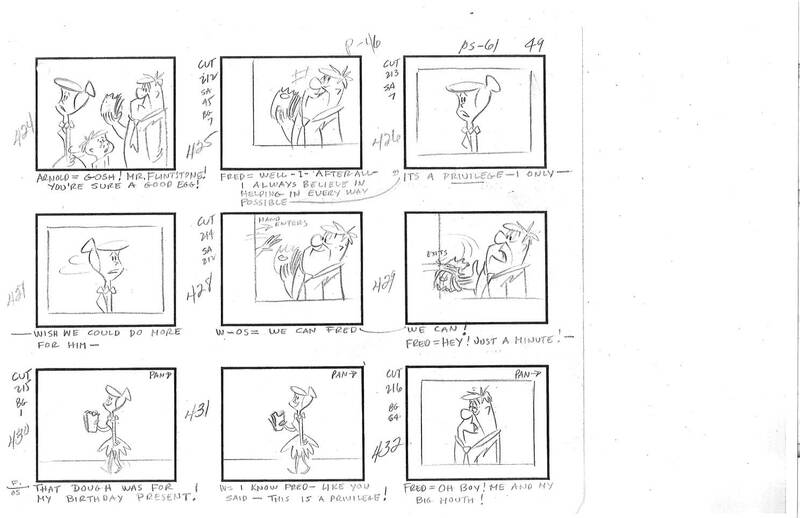 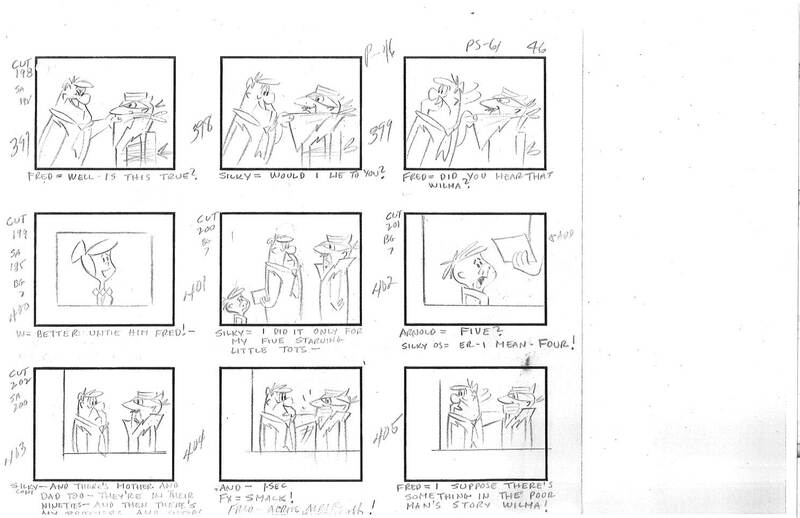 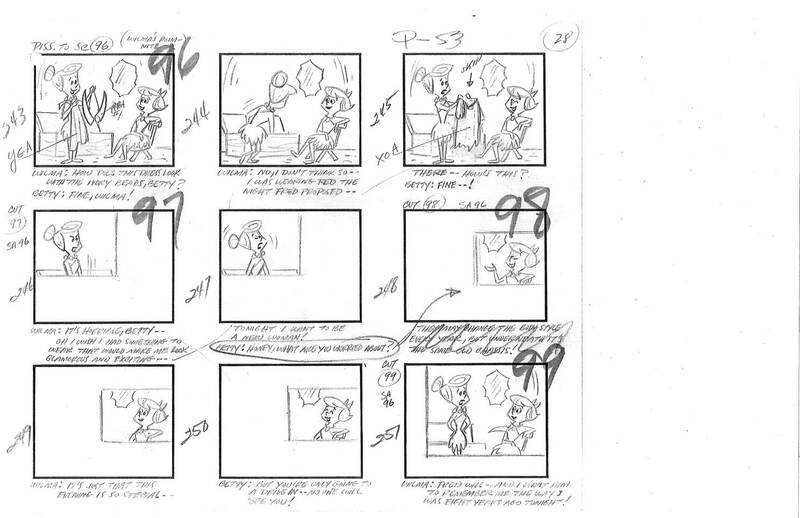 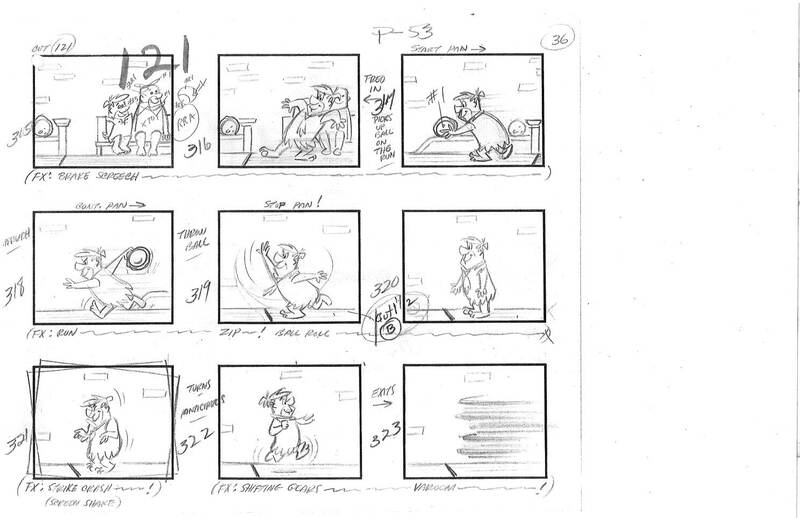 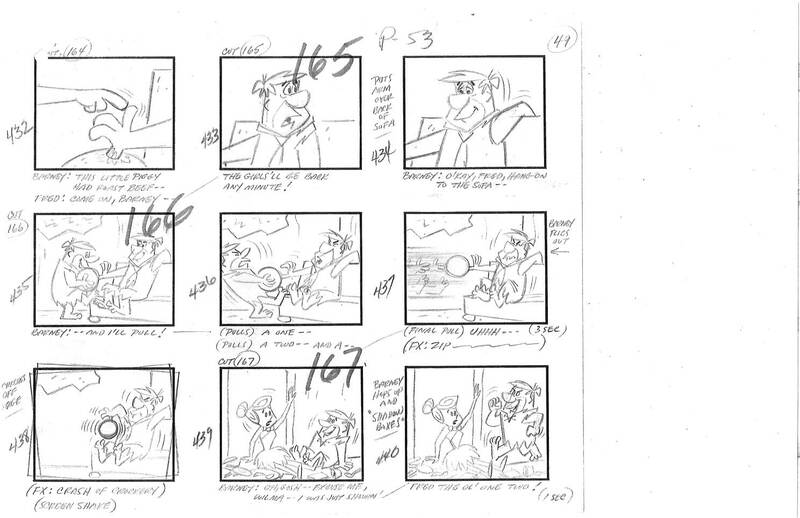 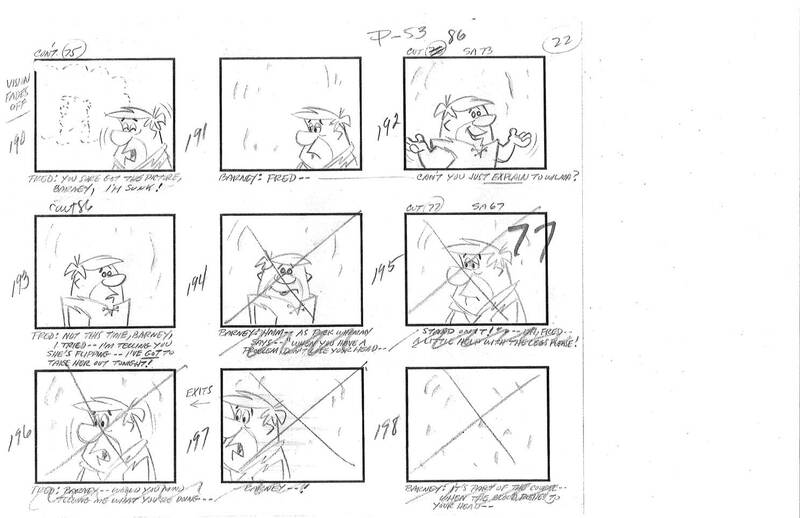 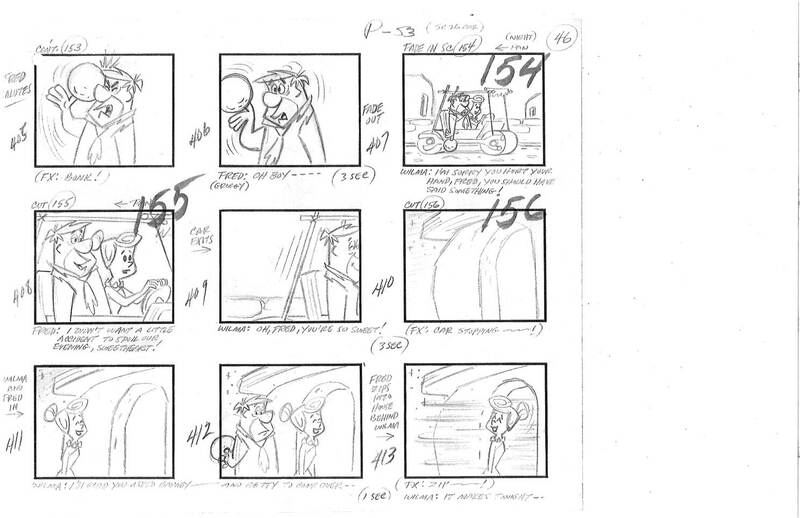 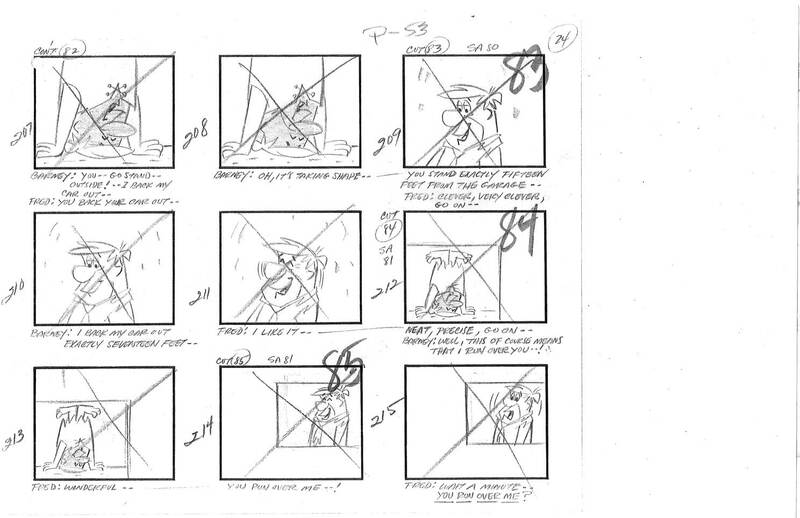 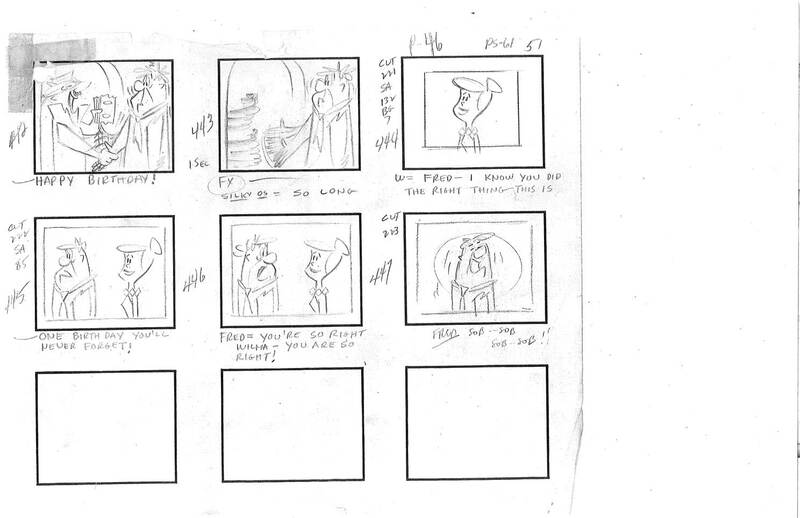 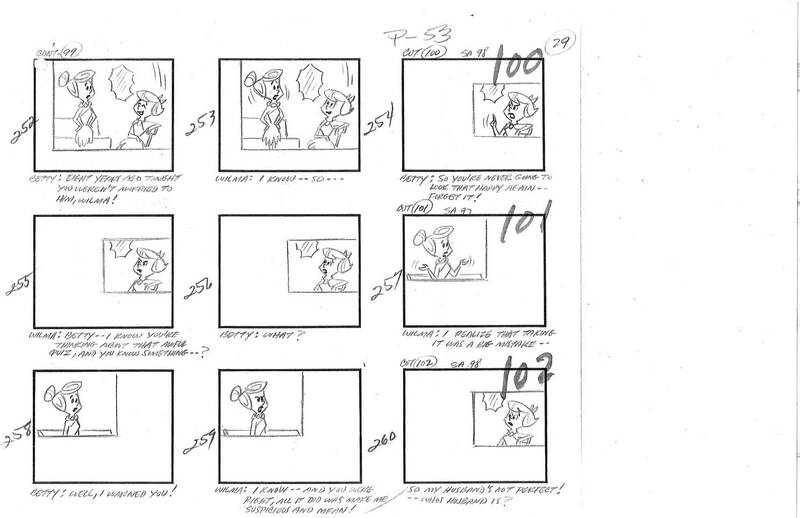 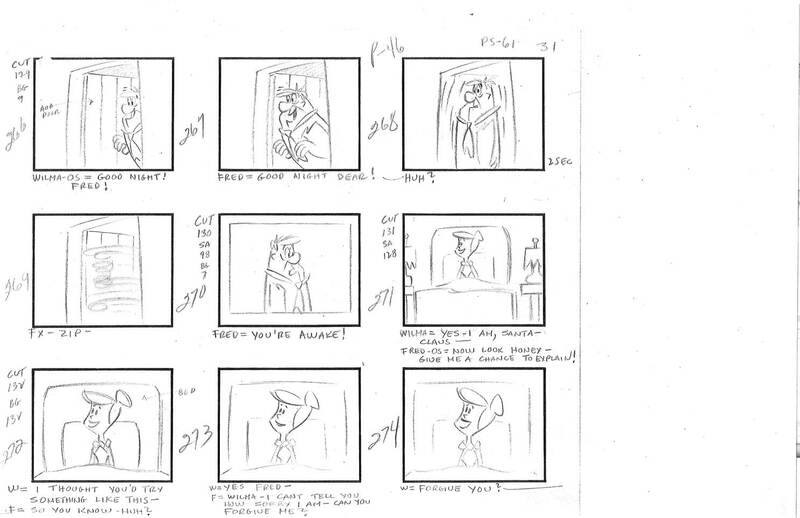 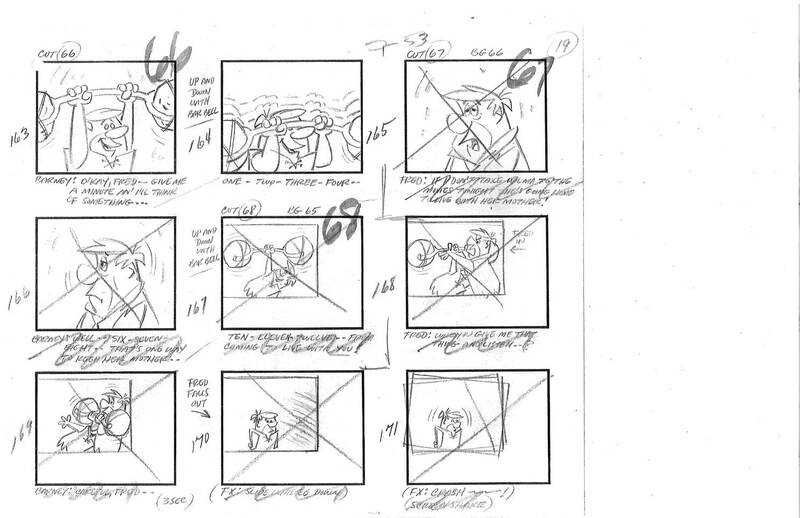 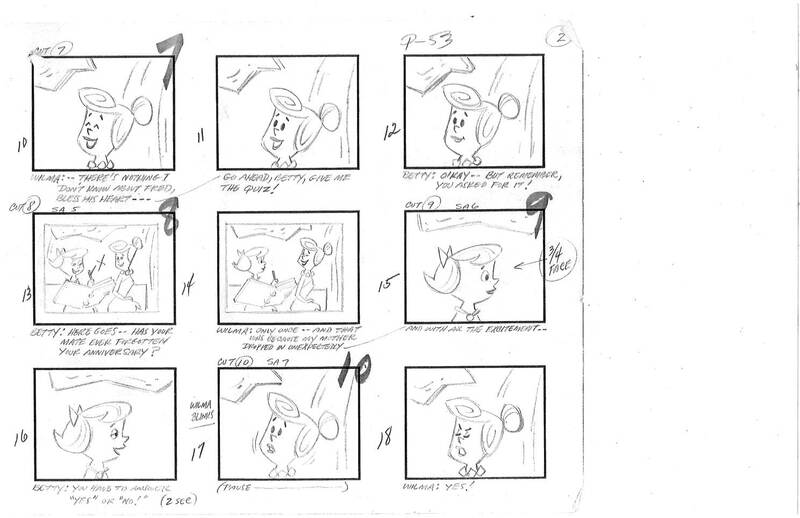 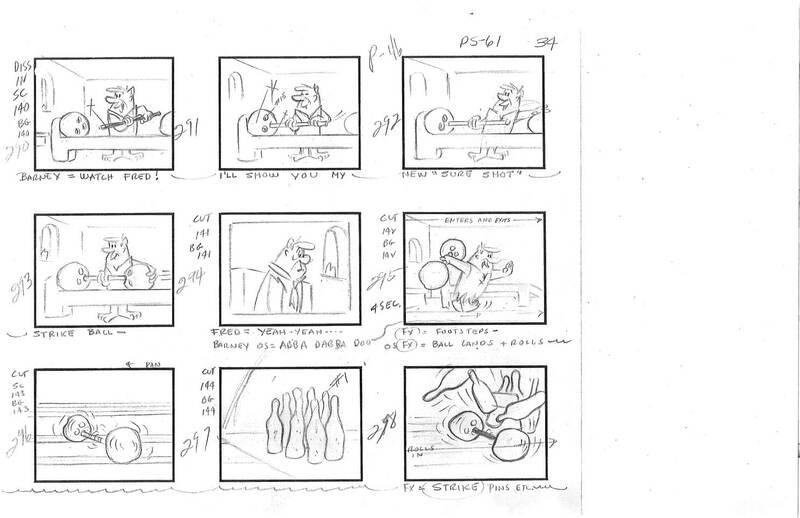 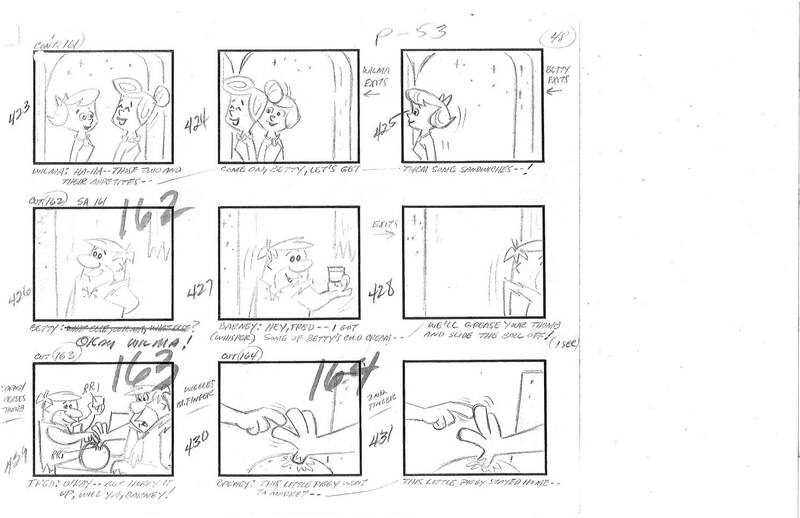 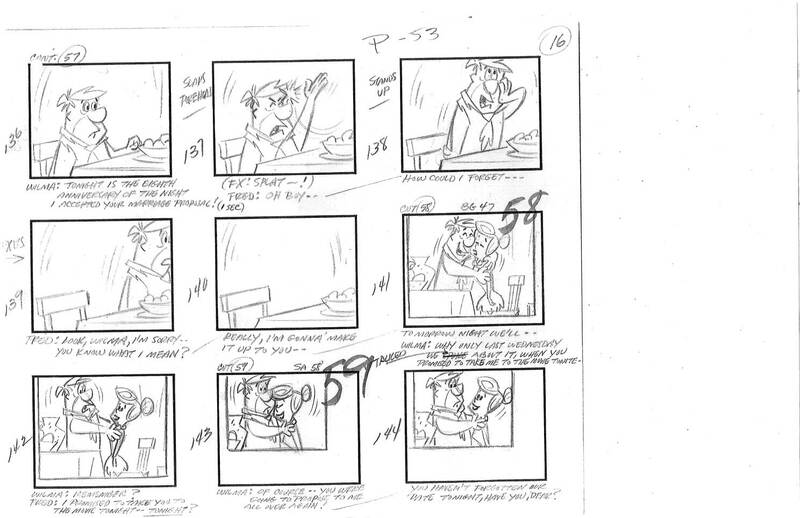 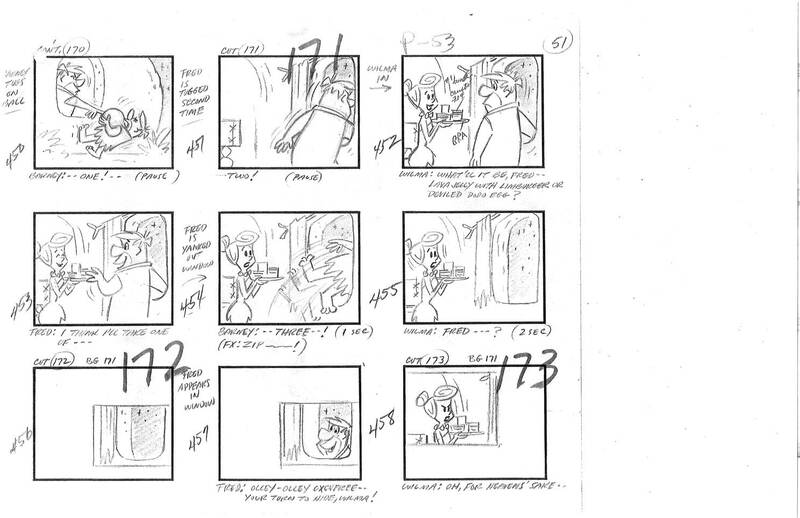 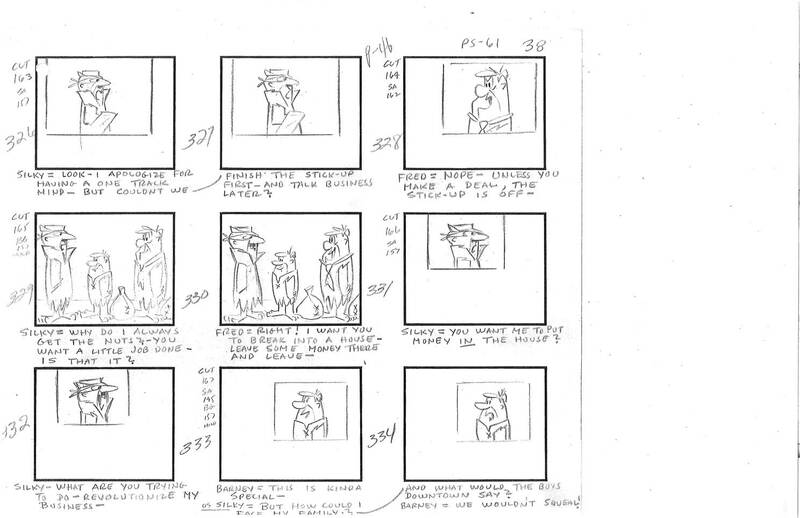 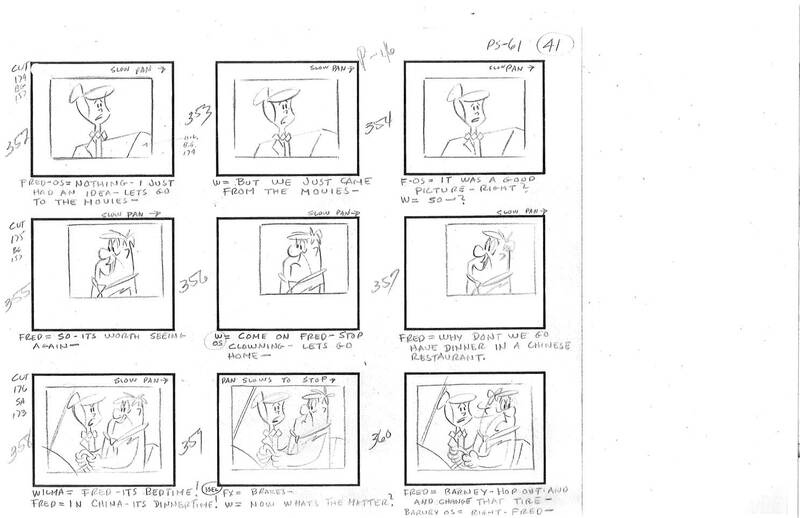 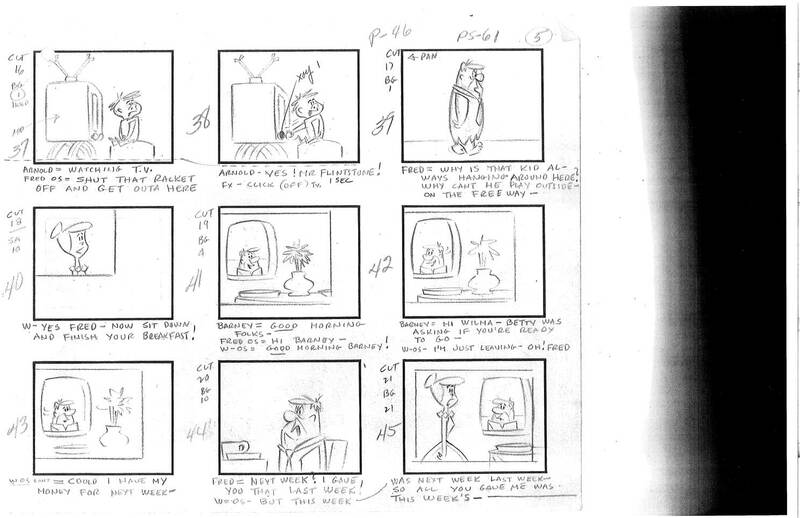 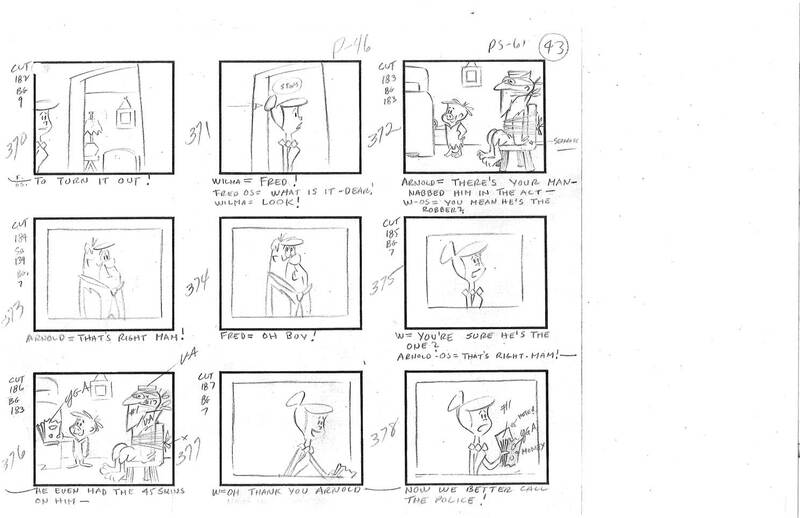 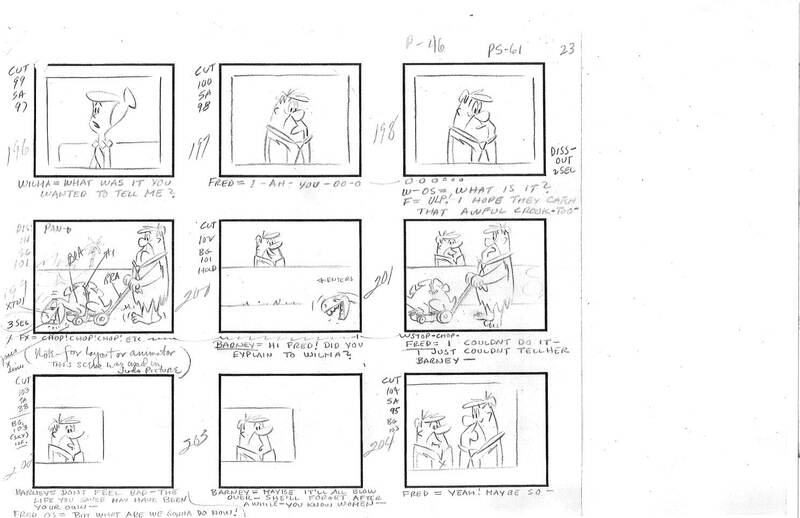 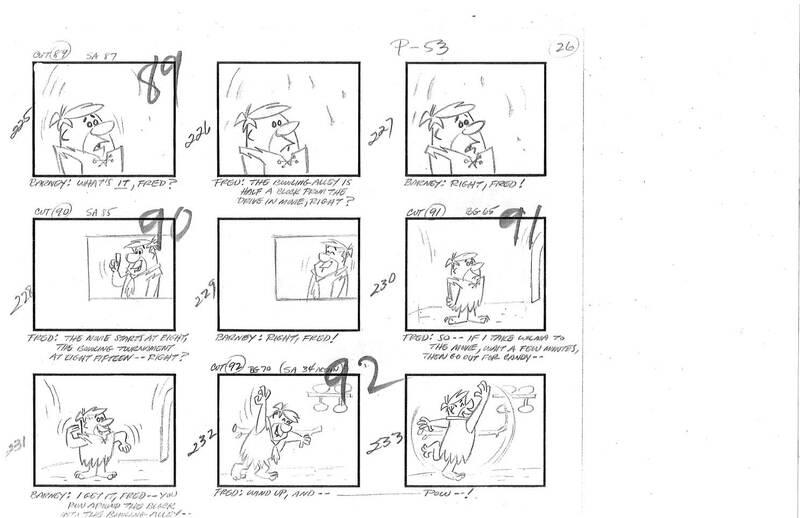 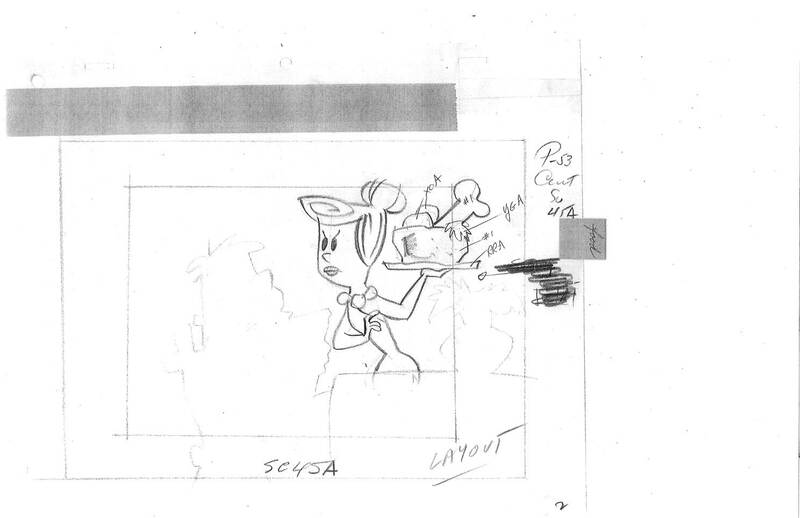 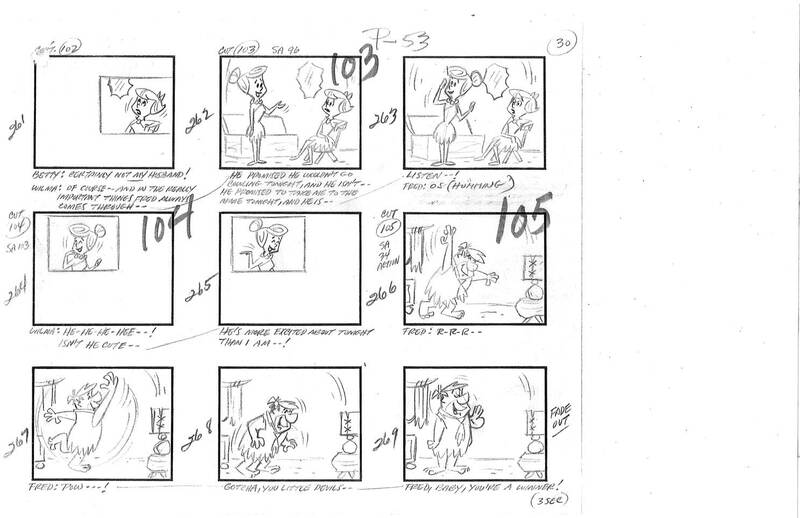 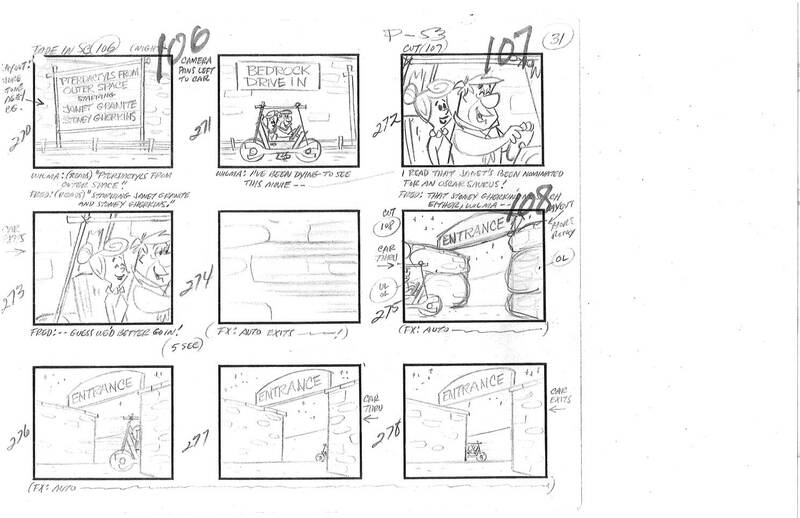 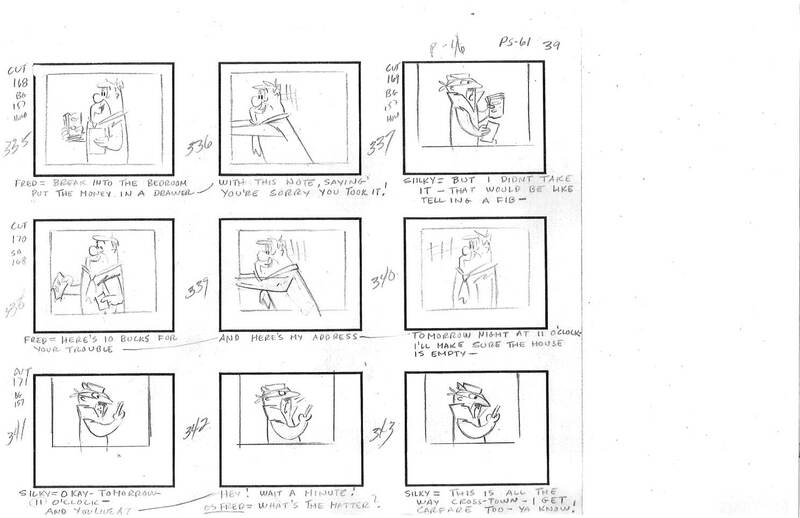 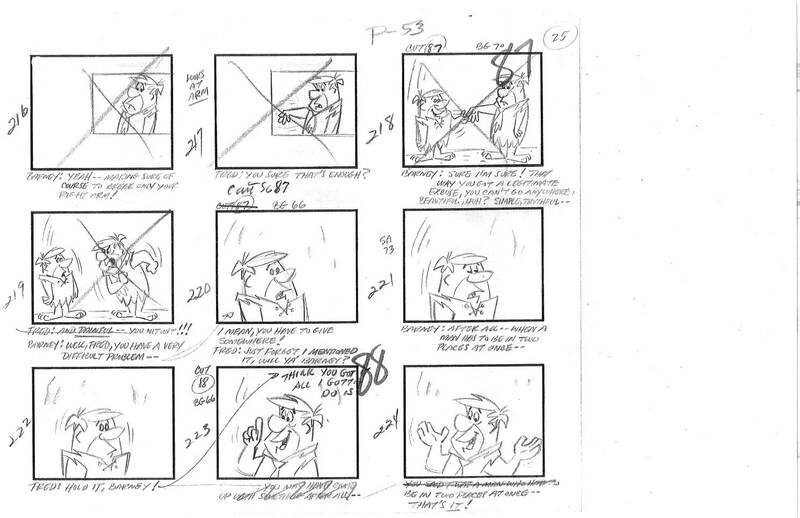 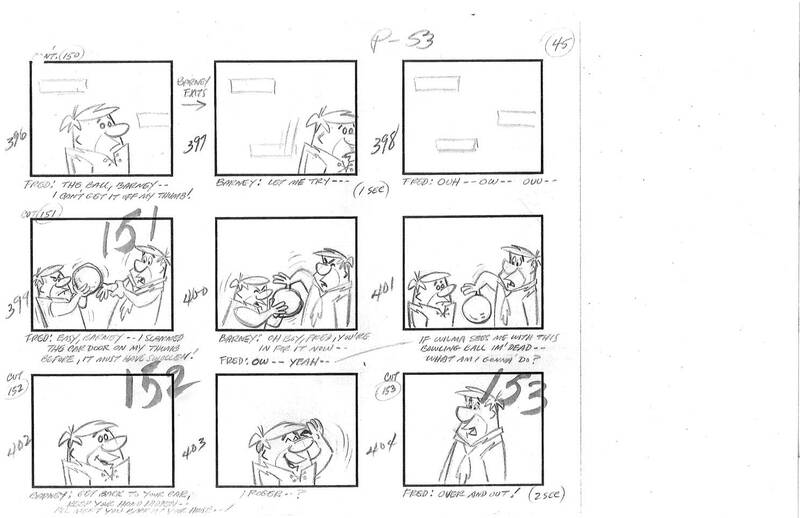 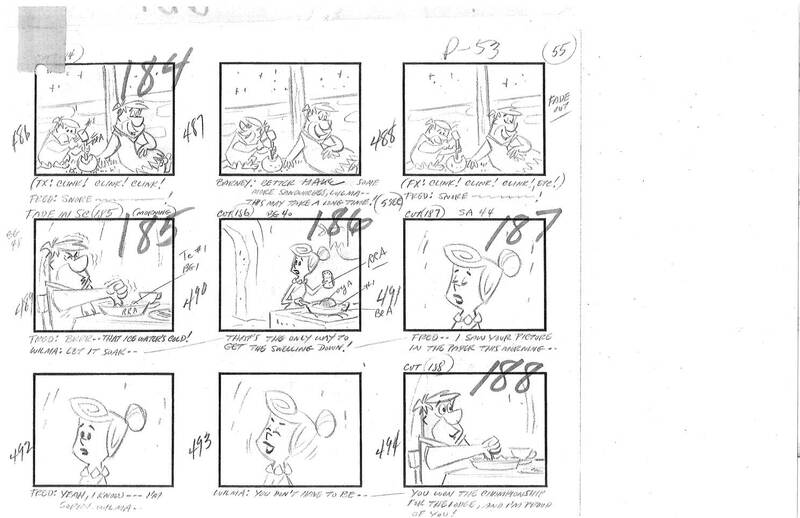 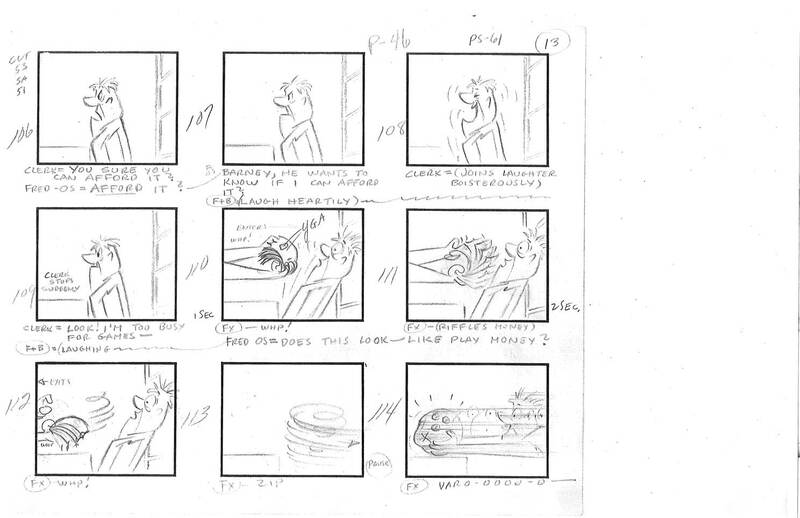 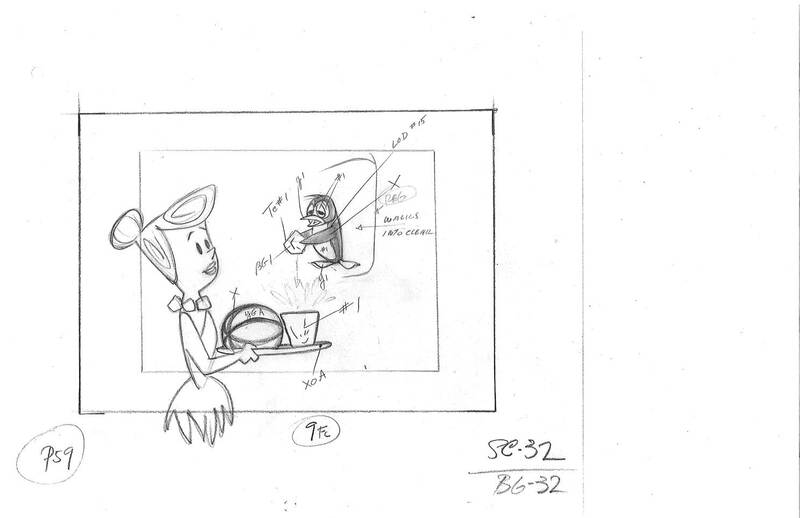 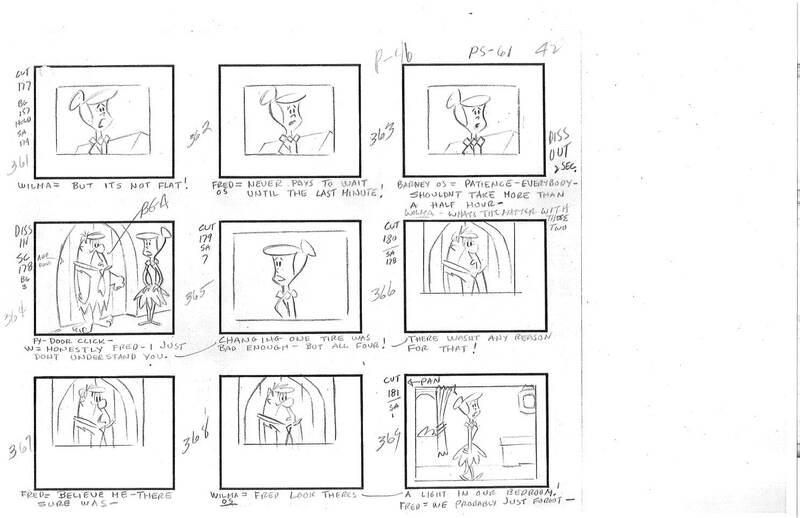 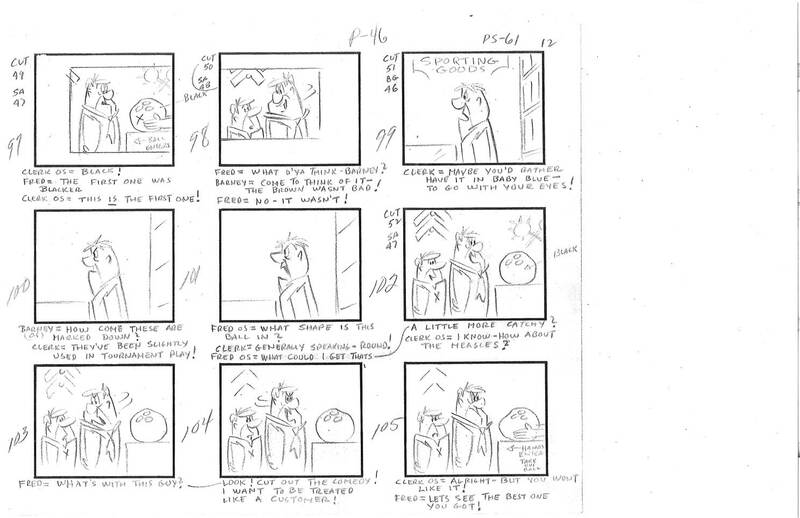 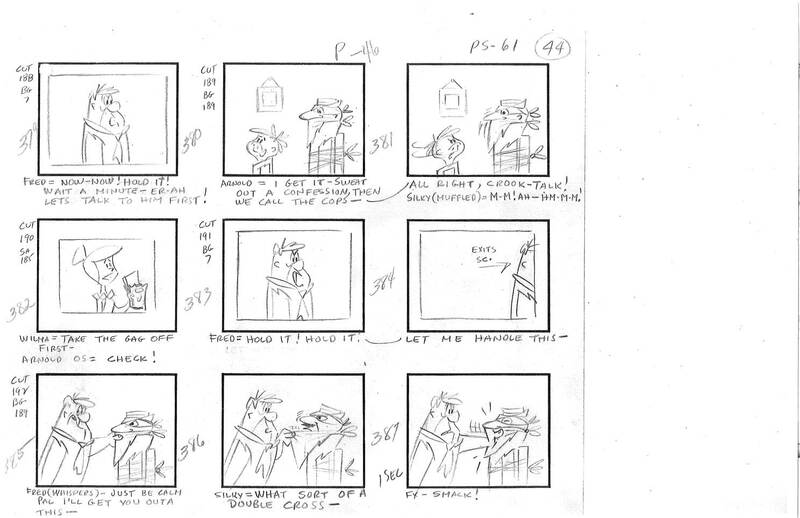 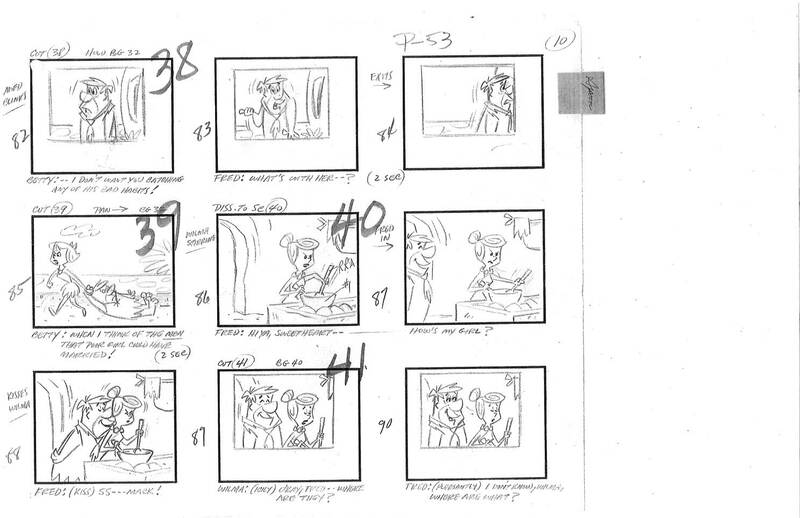 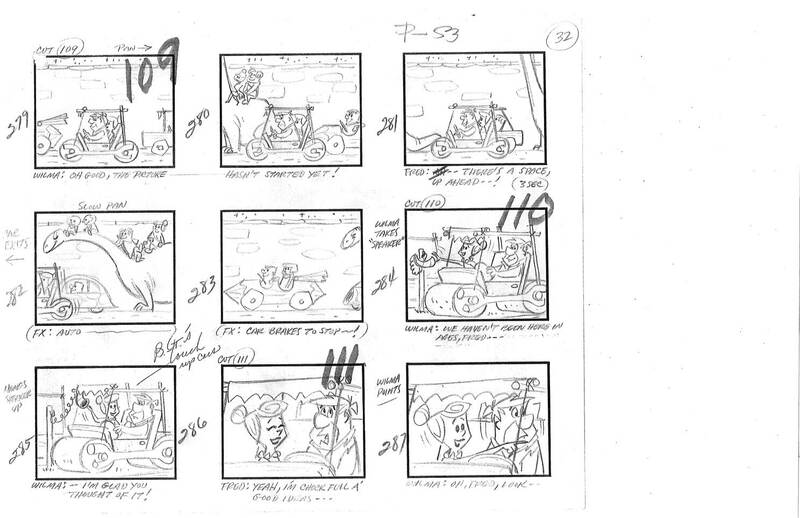 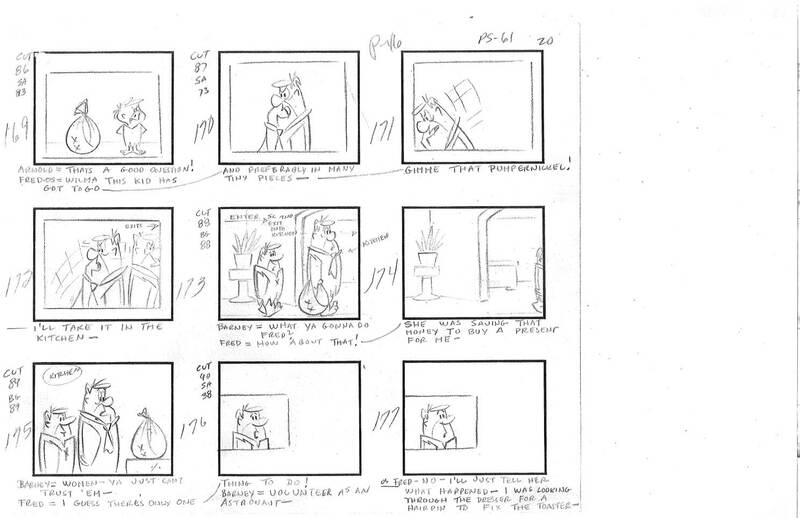 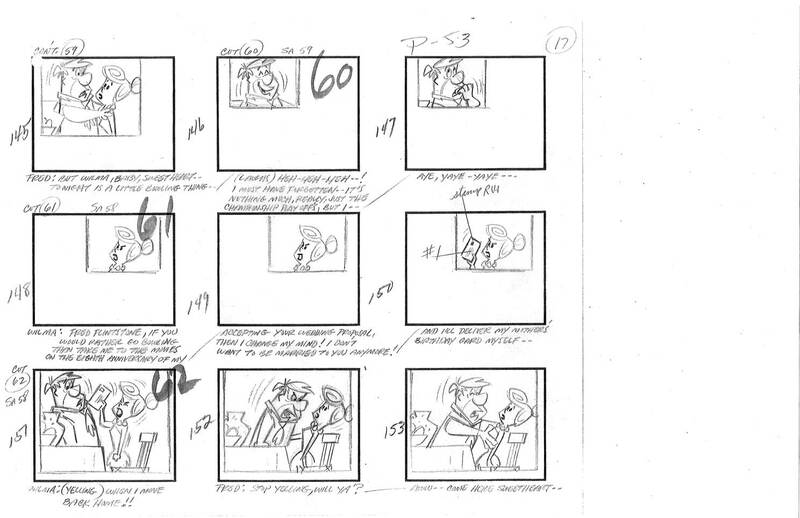 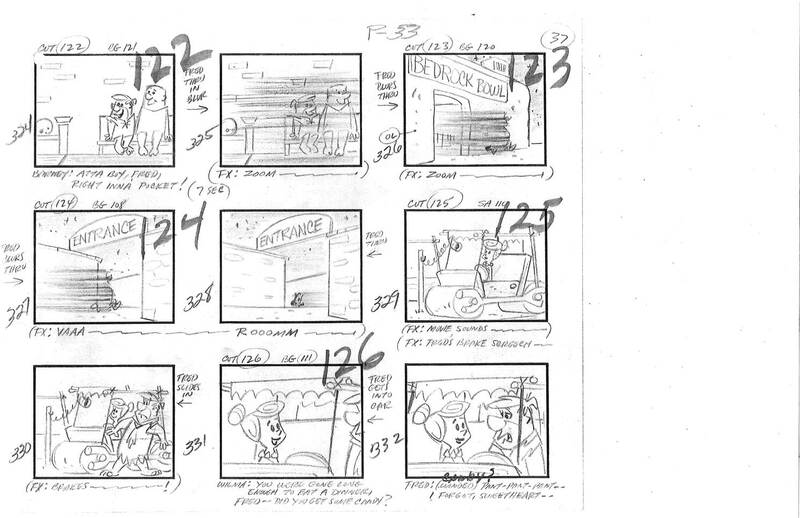 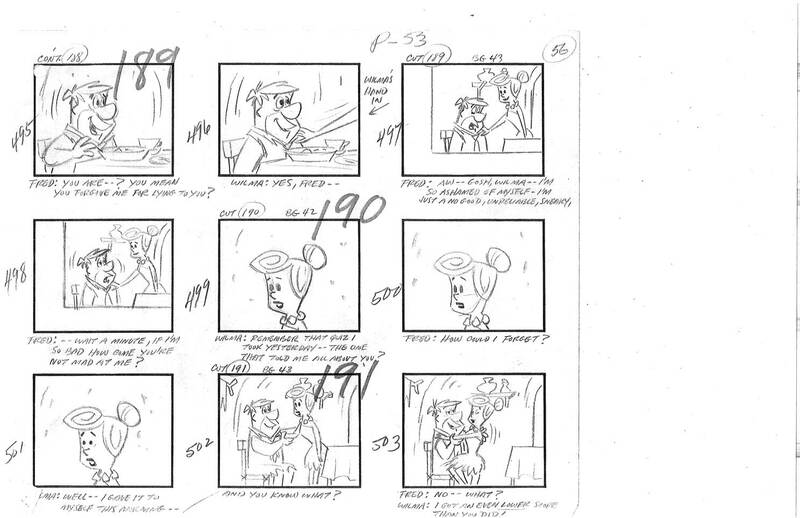 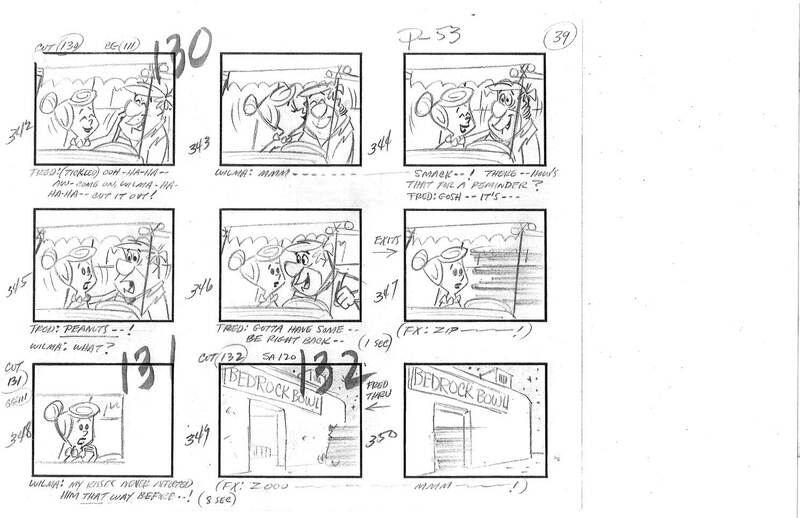 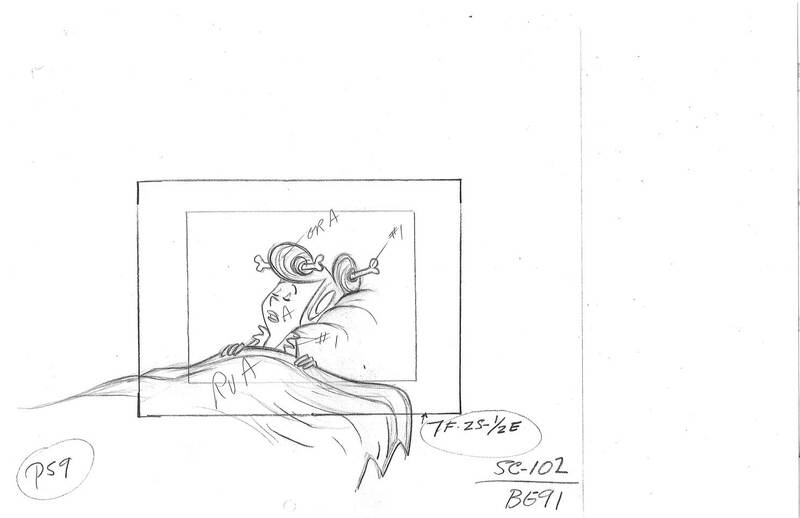 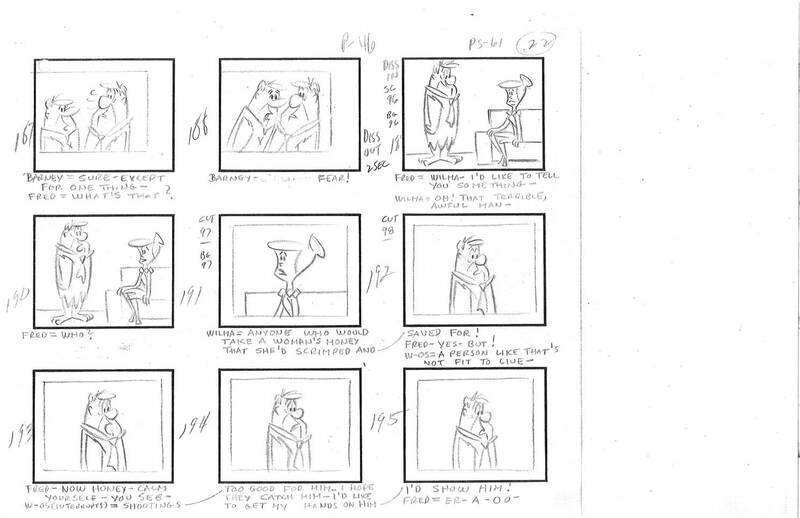 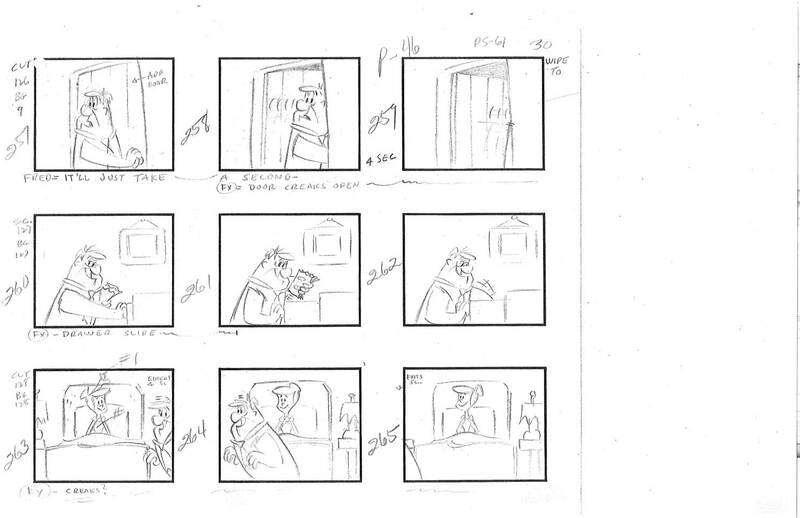 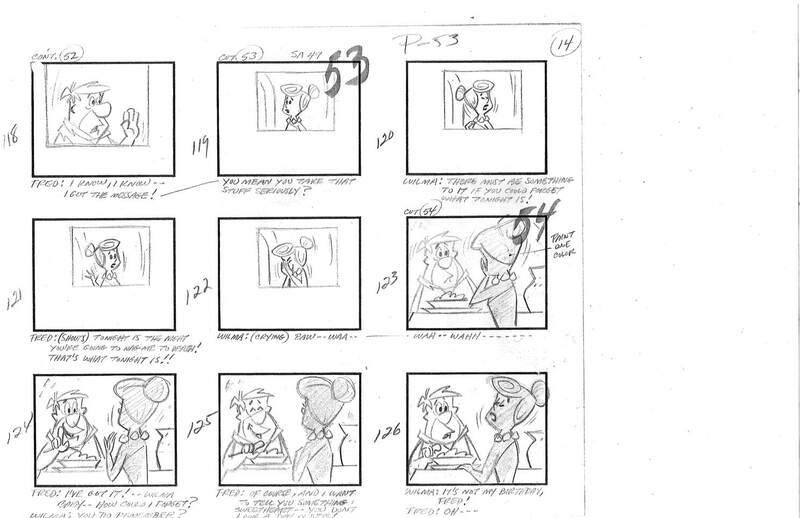 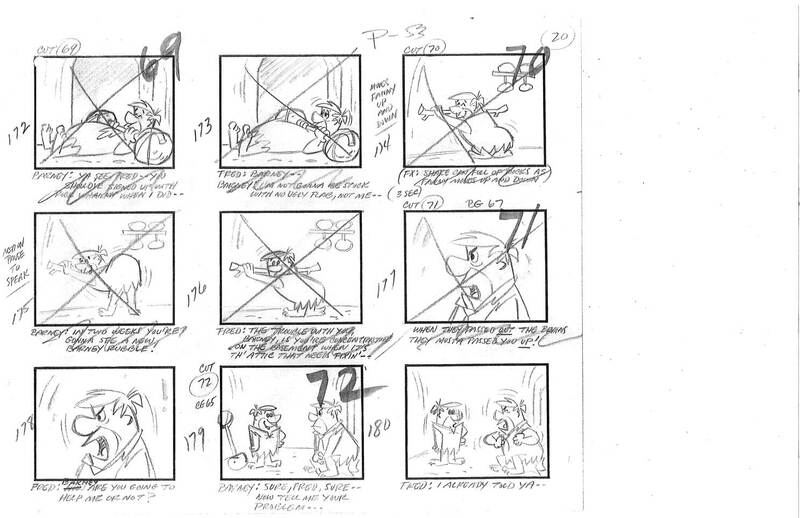 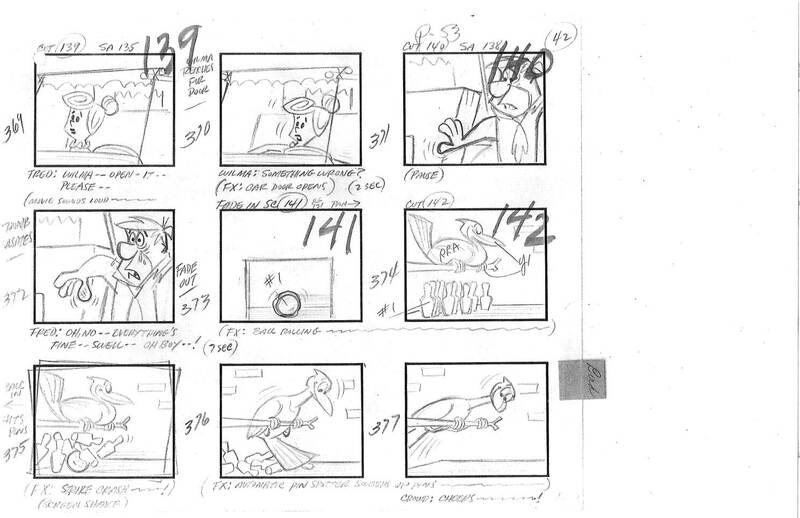 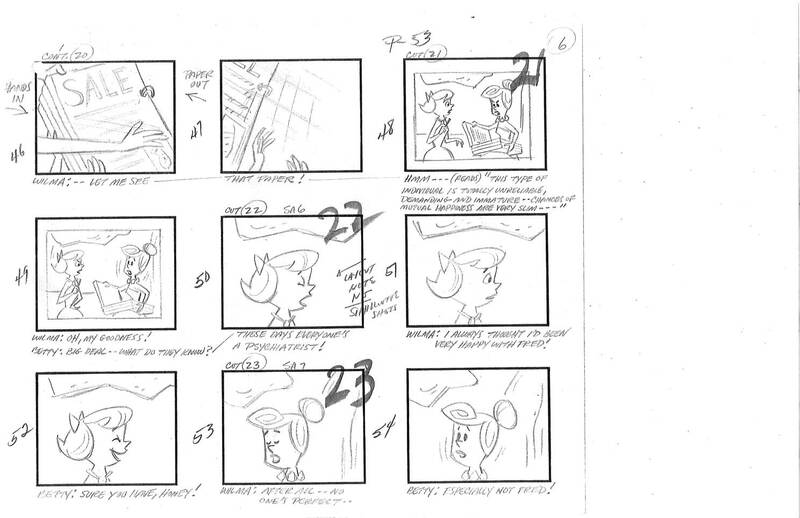 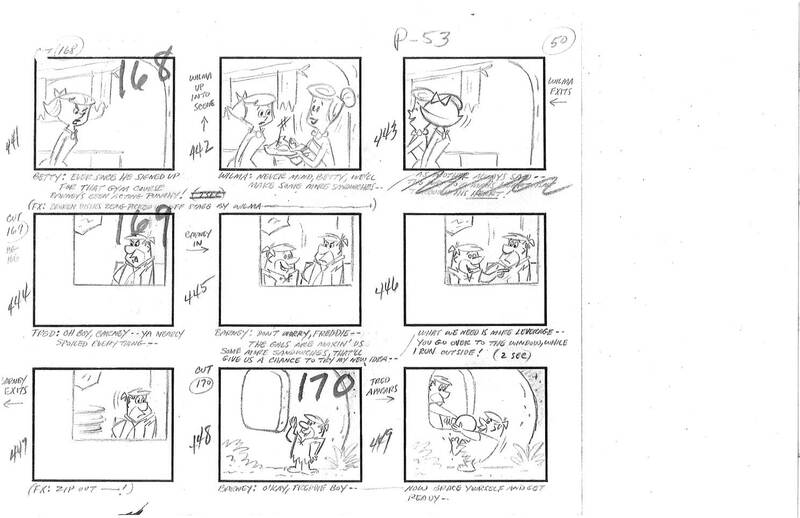 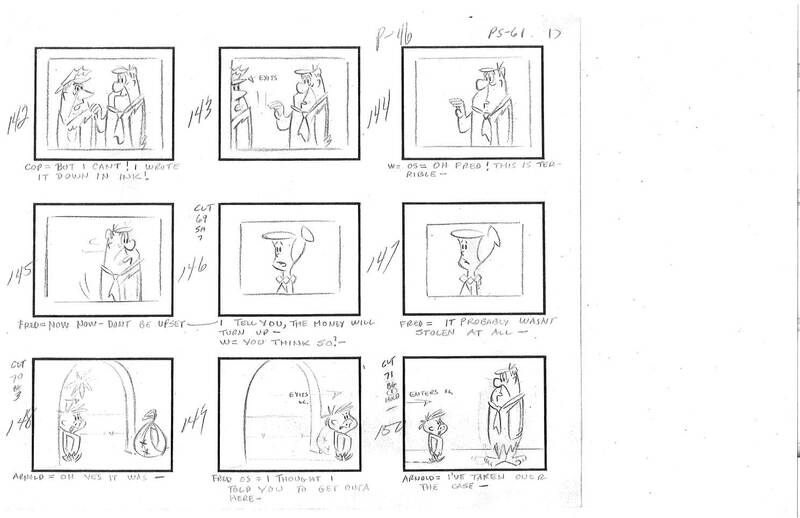 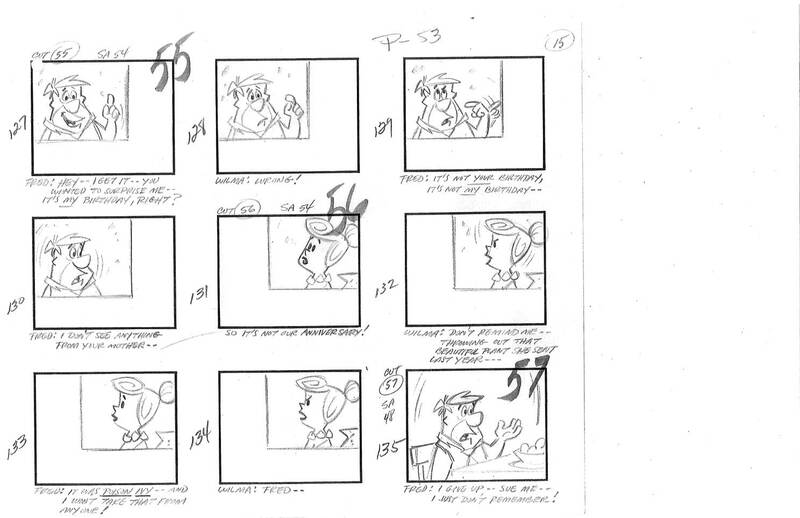 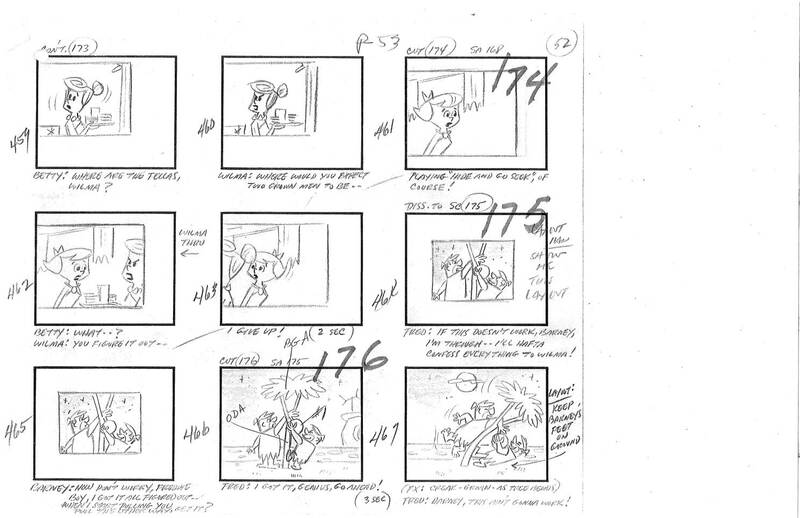 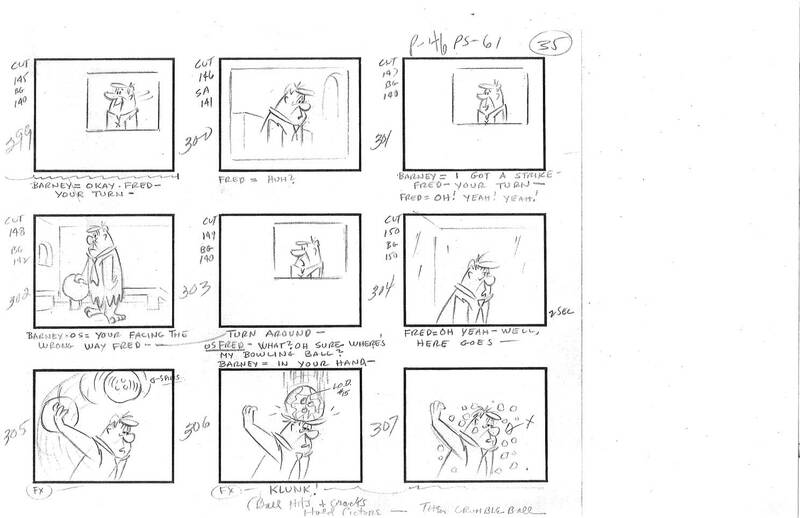 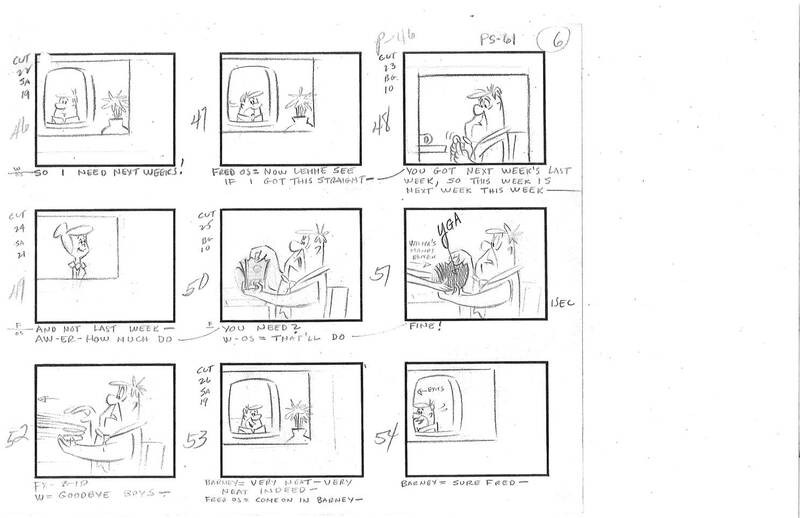 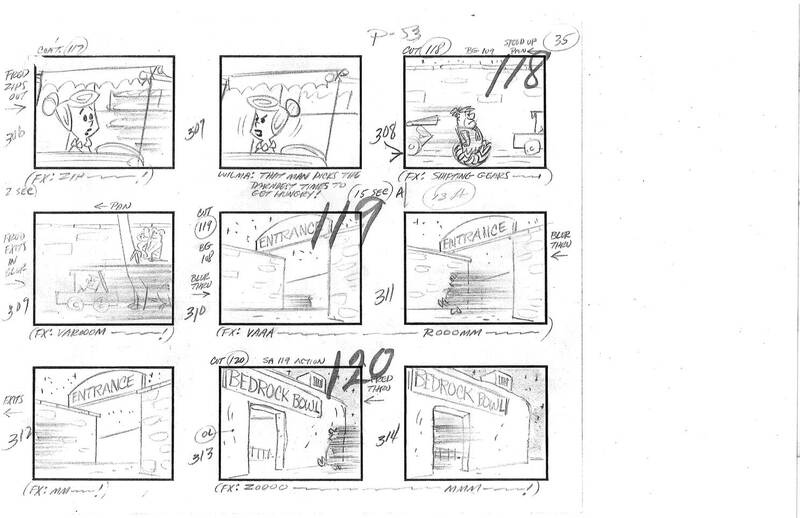 Anyway, without further adieu I give you orignal scans of the storyboard for Episode 72; Fred Strikes Out, written by Joanna Lee. 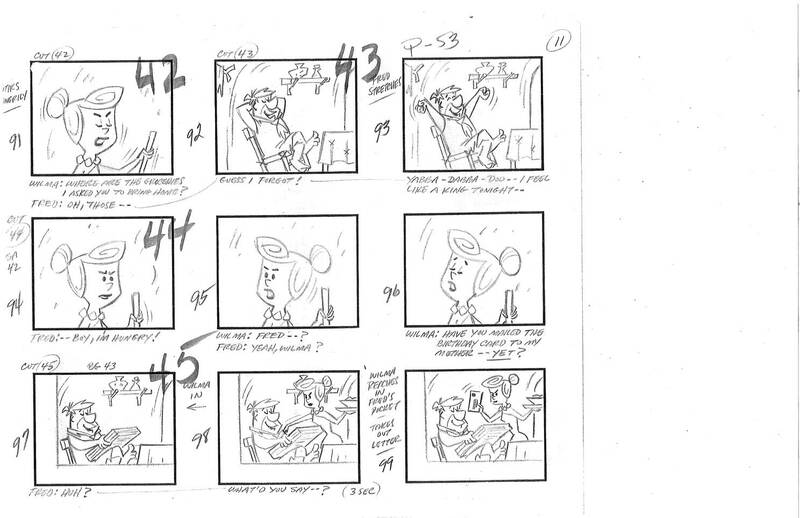 I don’t know who boarded it but IMDB says Don Jurwich and Lin Larsen did layout so it might have been one of them. 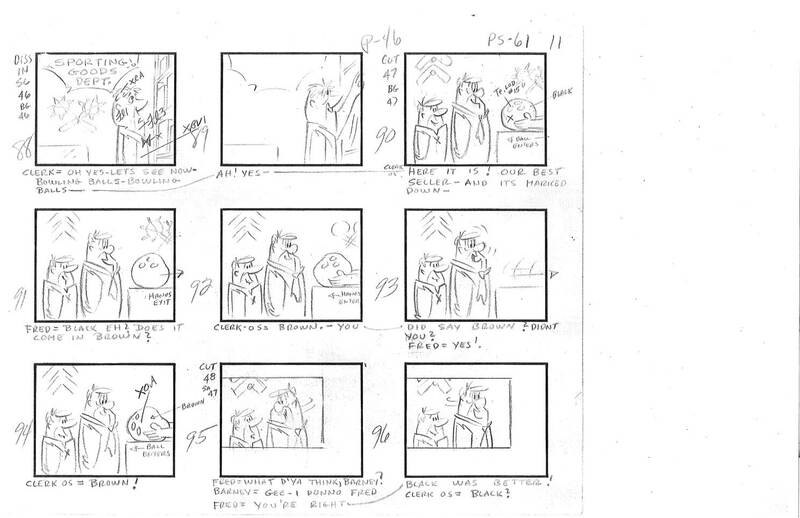 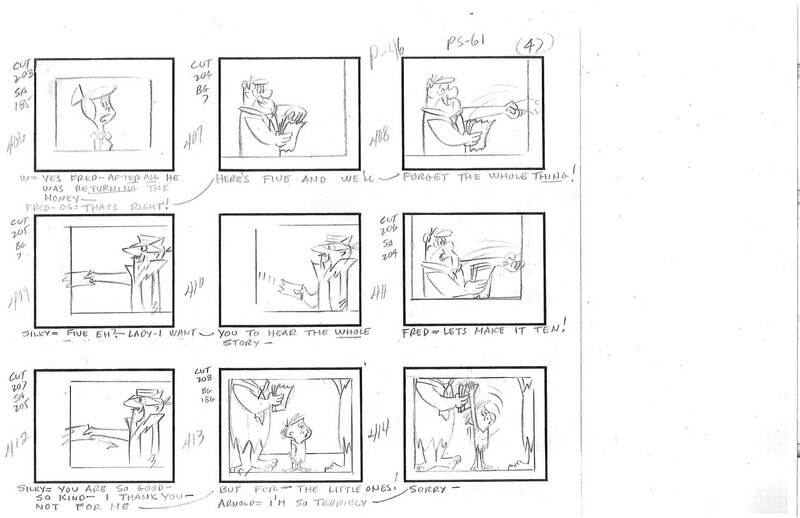 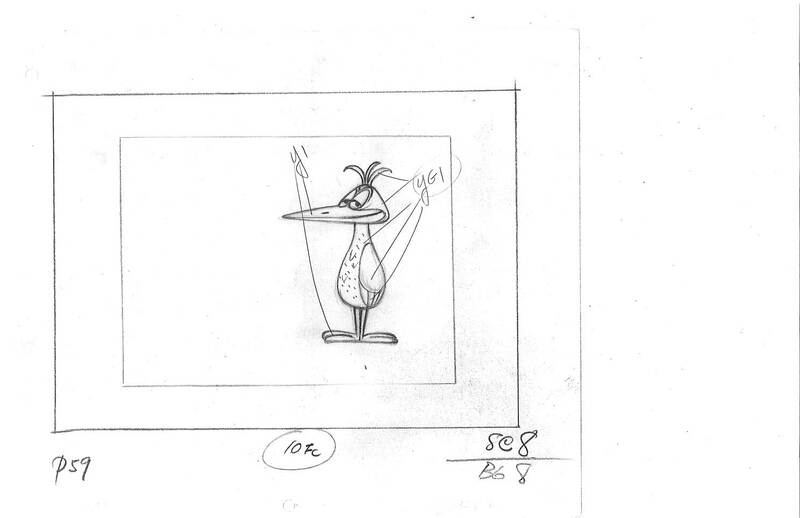 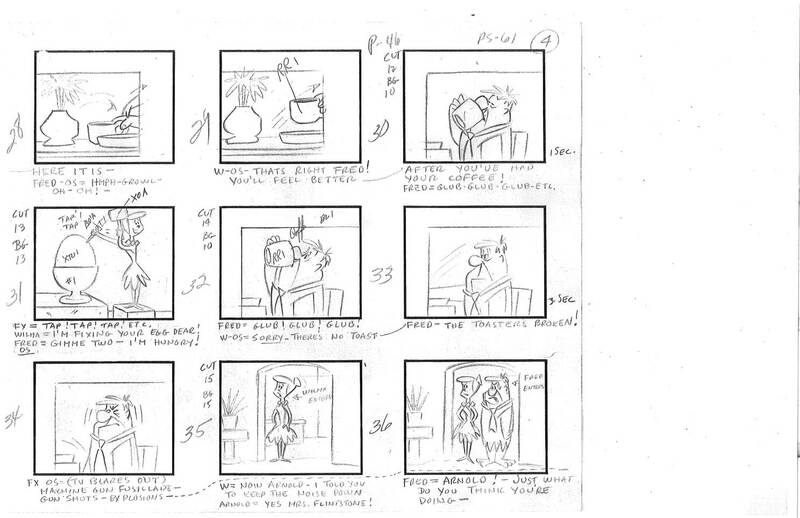 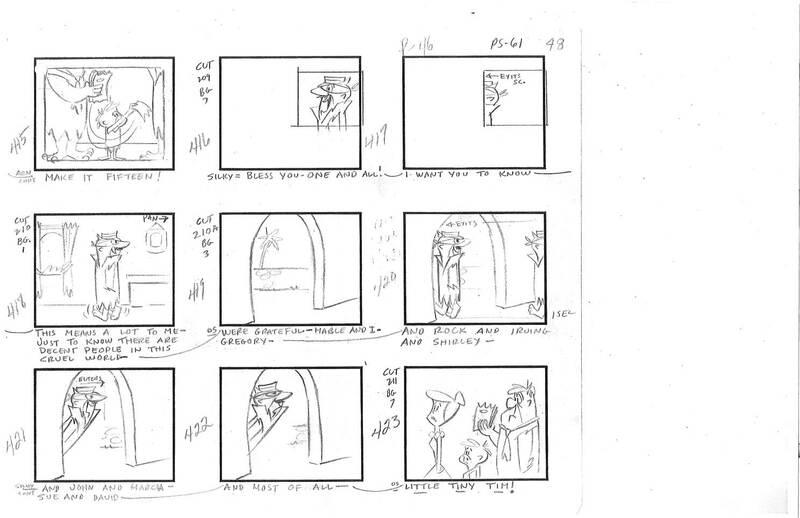 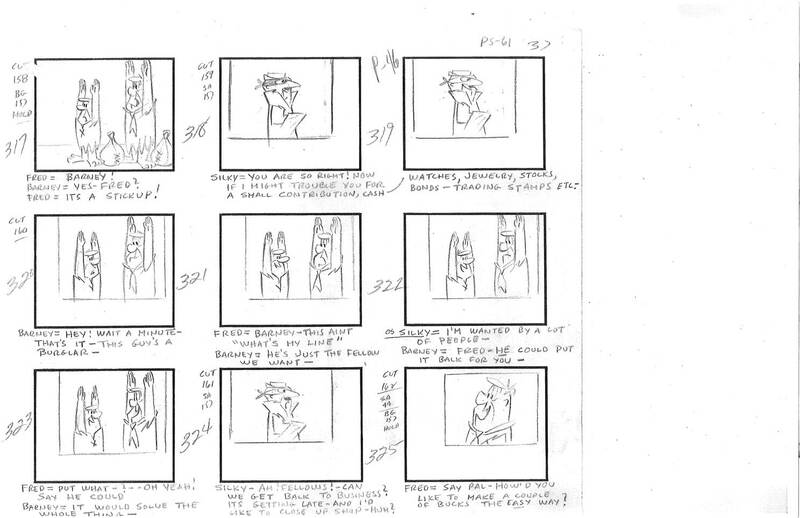 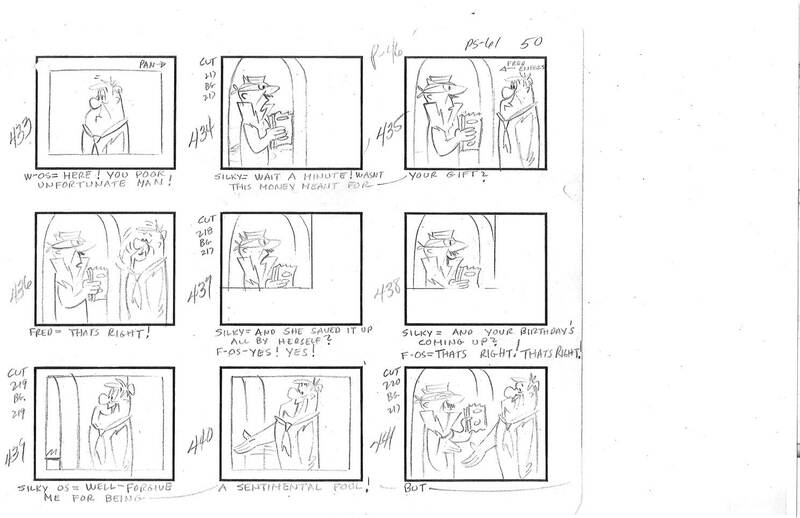 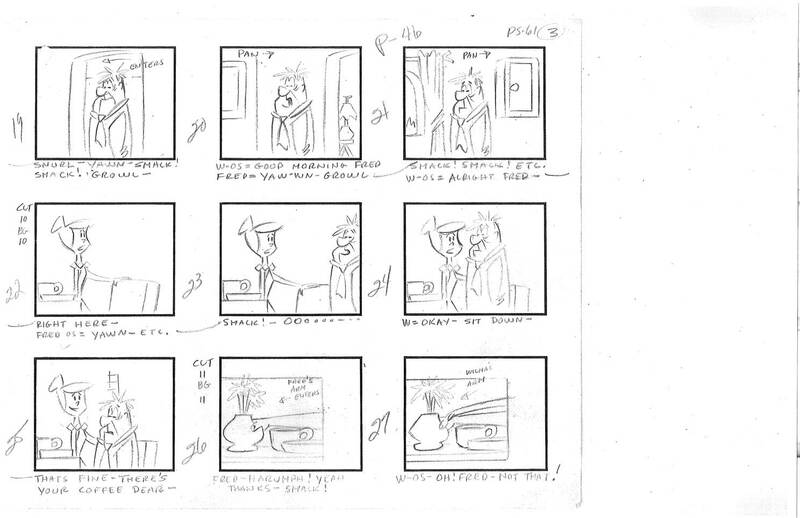 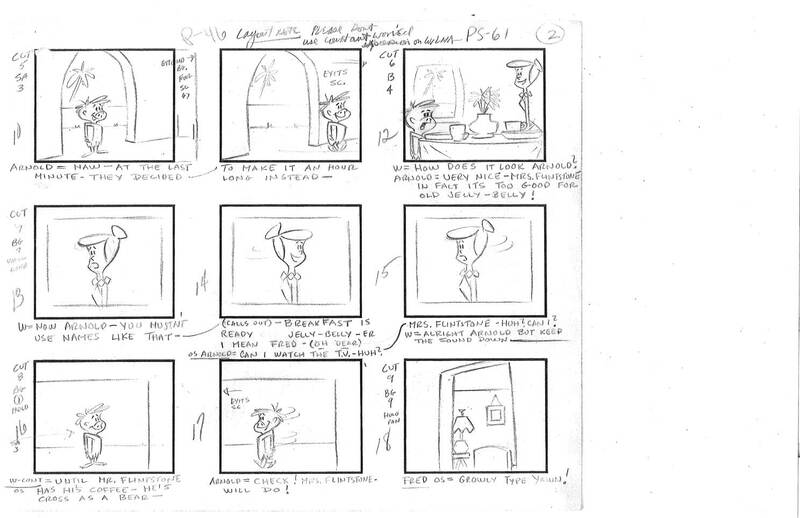 It also includes some storyboards made by Alex Lovy. 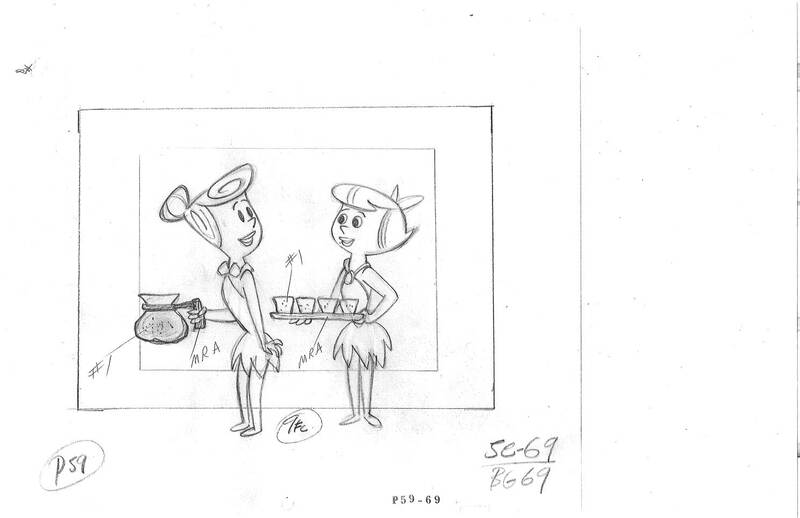 We cannot forget that Joanna Lee – who scripted great part of the episodes from The Flintstones (Hanna-Barbera/Columbia Pictures, 1960-66) – also scripted some episodes from Bewitched (Ashmont Productions/Columbia Pictures, 1964-72).